Continue along this bank beside the river. 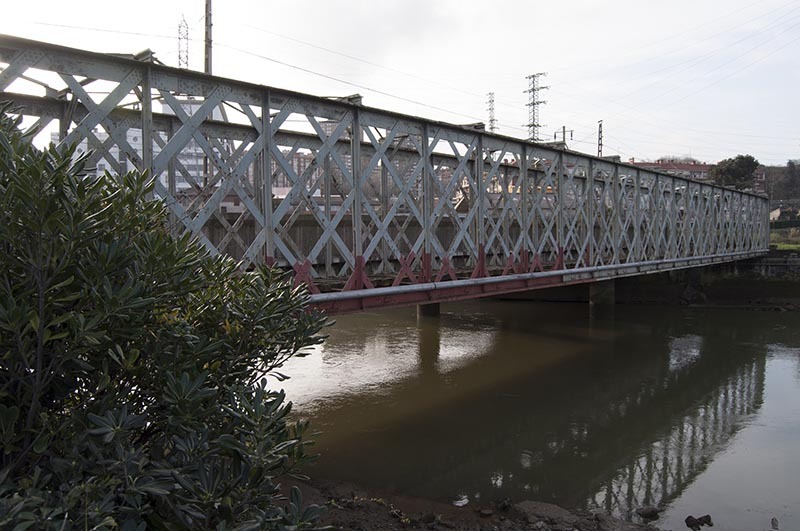 The route runs mostly on a pedestrian path. 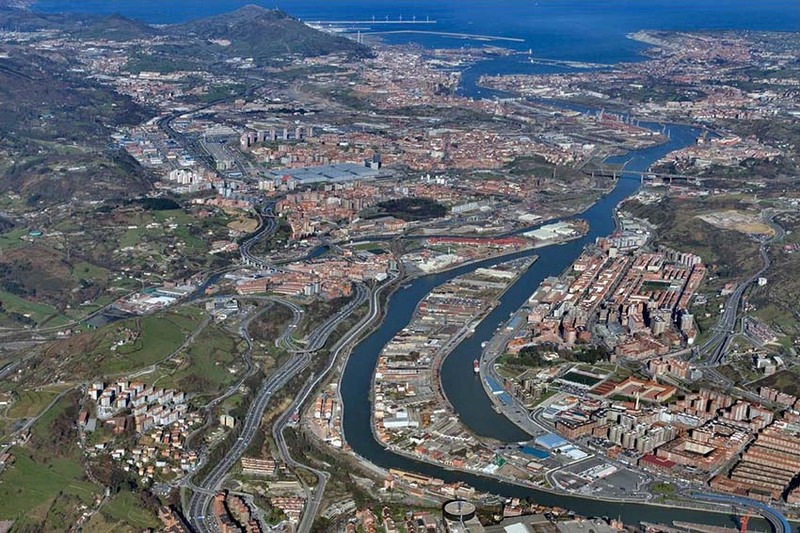 You will have a view with greater perspective and less detail, but it will allow you to return to Bilbao by an alternative route. 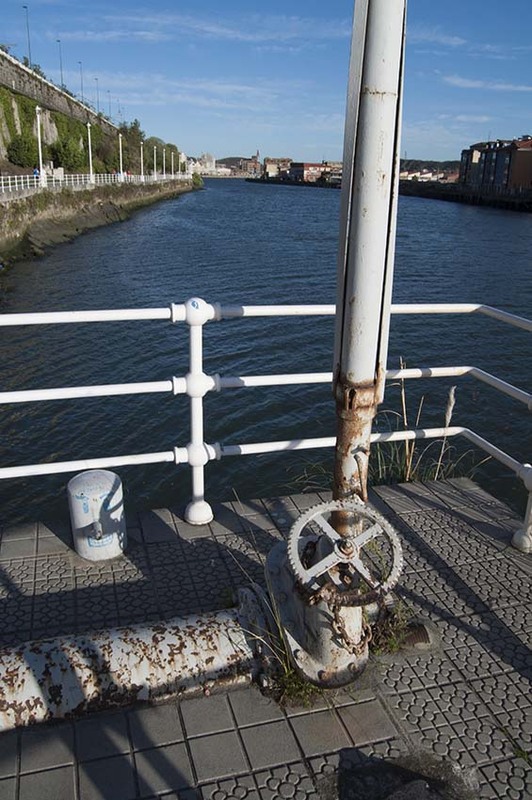 Walk along the opposite bank of the river. 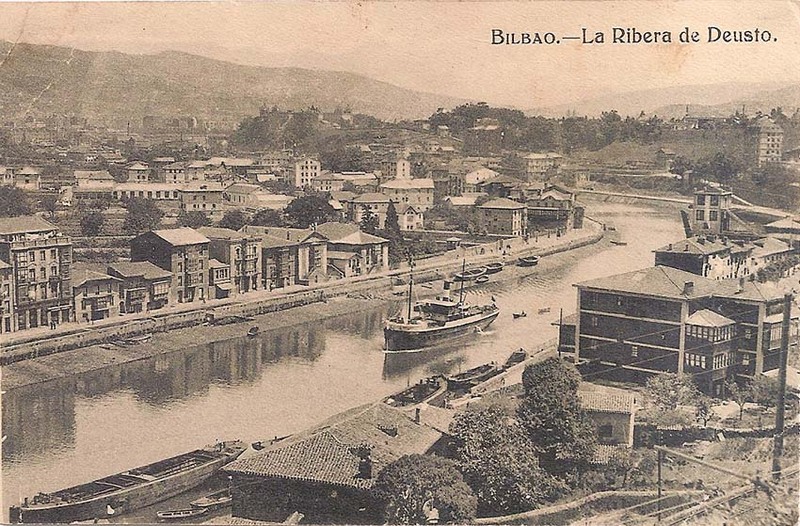 You will see the buildings in much greater detail, but you will have to retrace your steps to return to Bilbao. 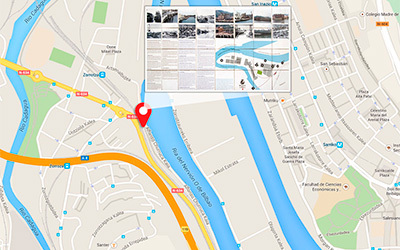 To follow this guide, take route 1 from the Maritime Museum. 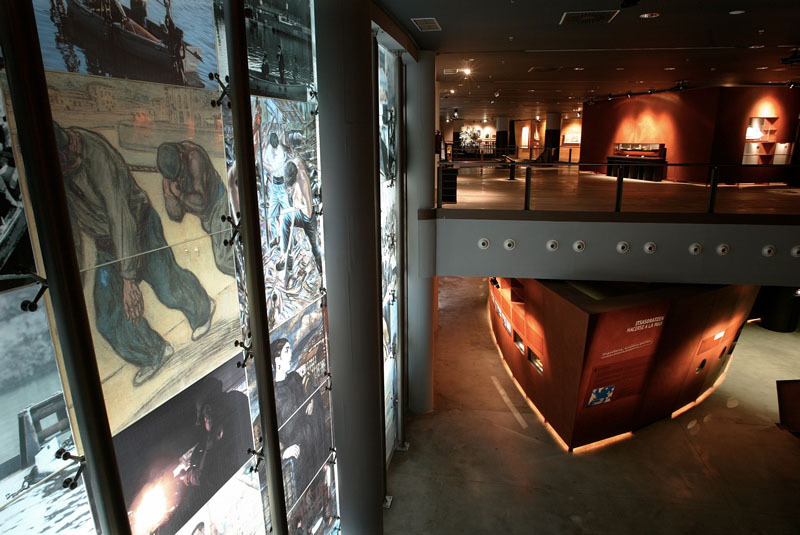 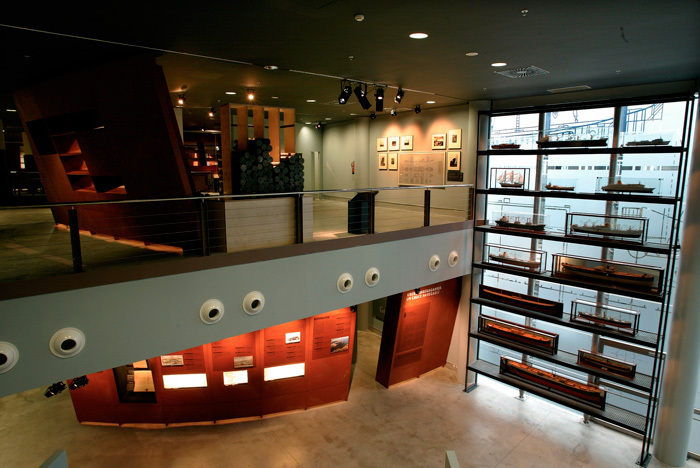 This museum keeps some of its exhibits in the old dry dock No 2 and, inside the museum, the displays show the close relationship of the city with the sea over the centuries. 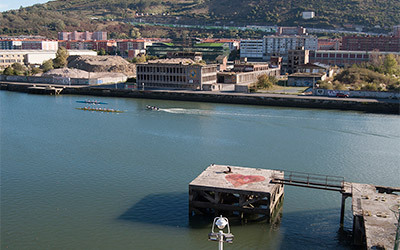 We walk to the neighbourhood of Olabeaga (Walk to the estuary - Spanish). 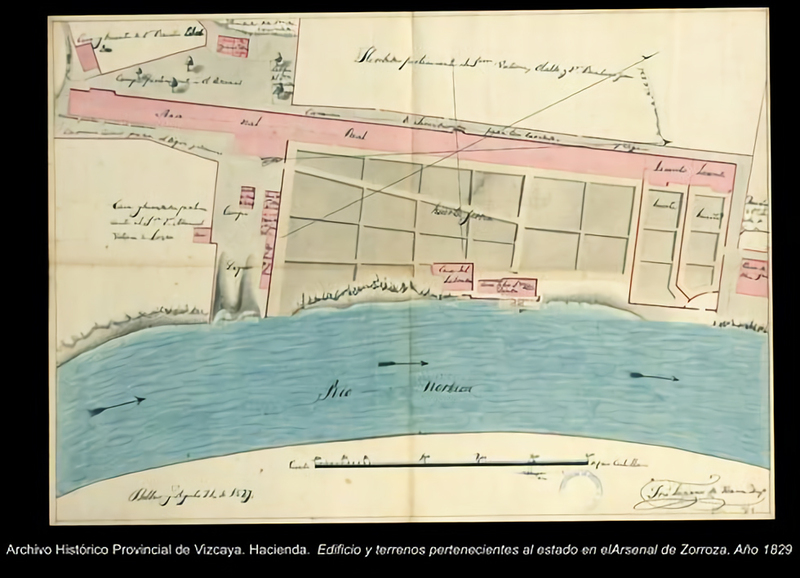 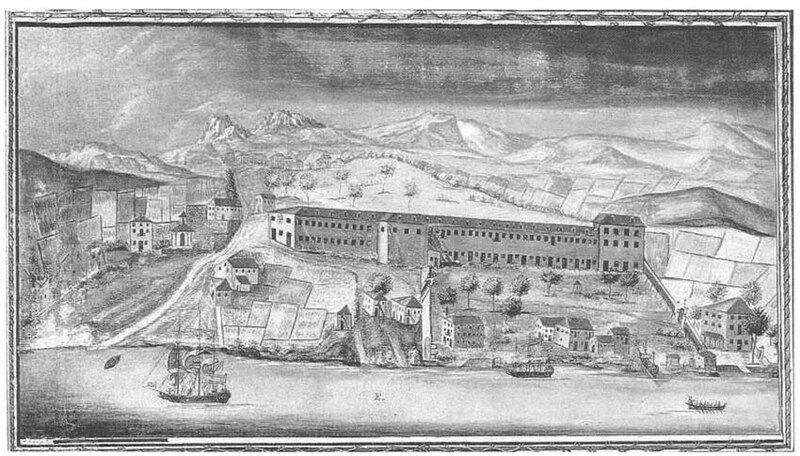 This is an enclave where most of its inhabitants had jobs related to sea (in shipbuilding, as sailors or as stevedores). 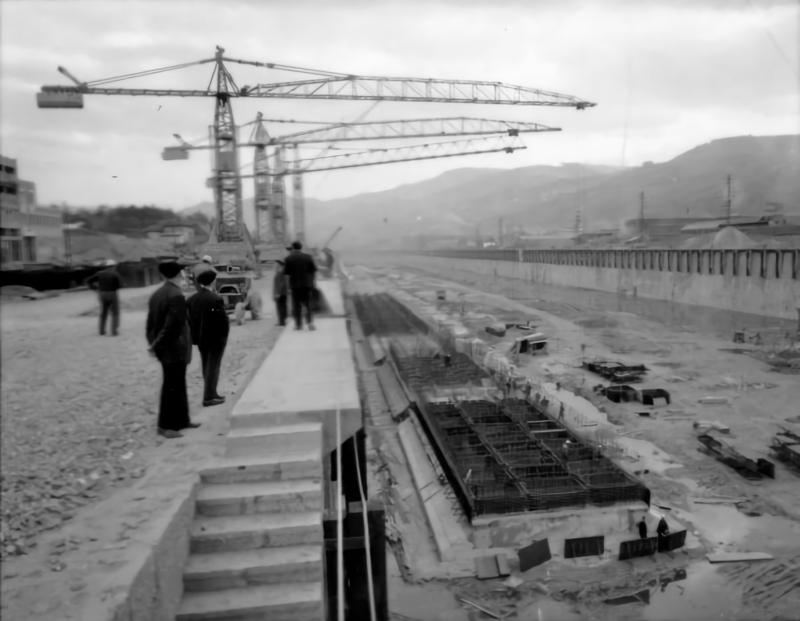 Today, all the landing bays and infrastructures devoted to these tasks have gone. The main historical elements are on the opposite shore. 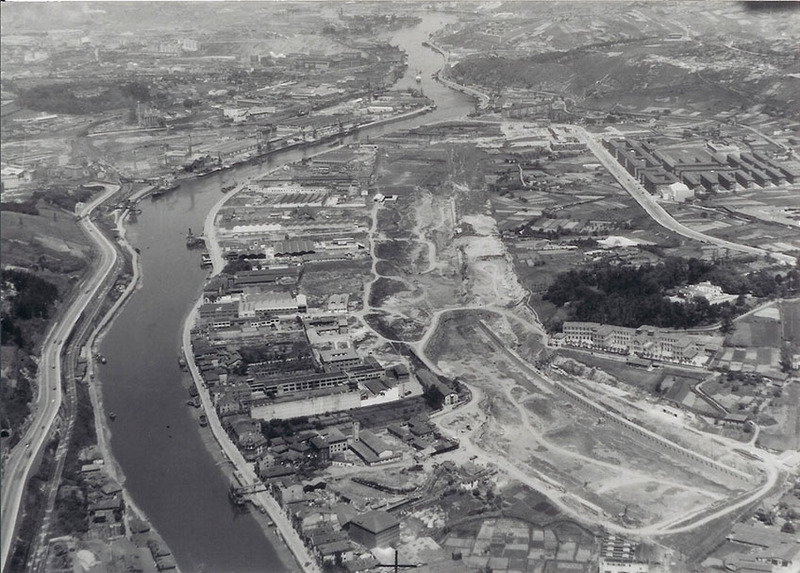 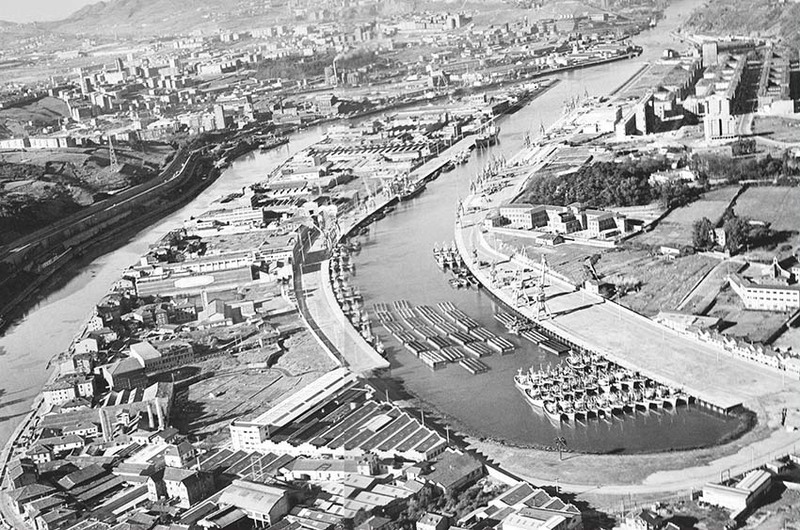 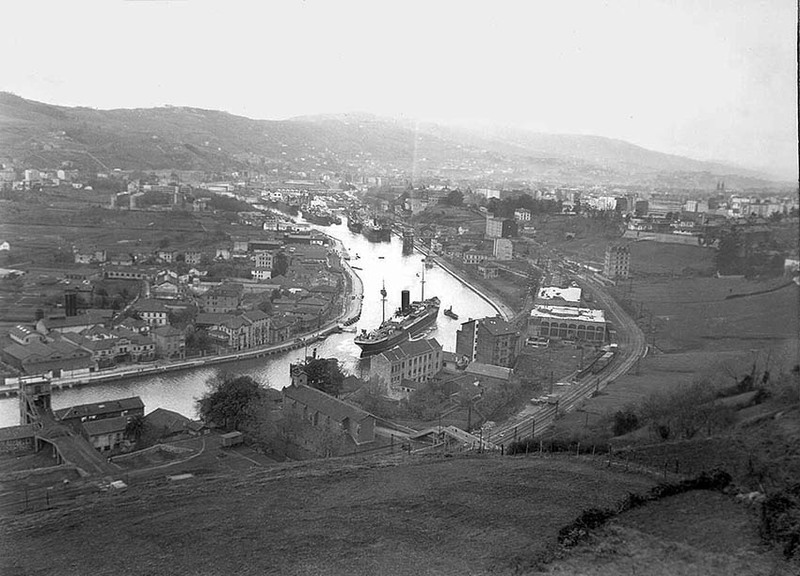 This was the Ribera de Deusto riverside neighbourhood until a huge canal was opened in the 1960s at the rear of the warehouses and flats. 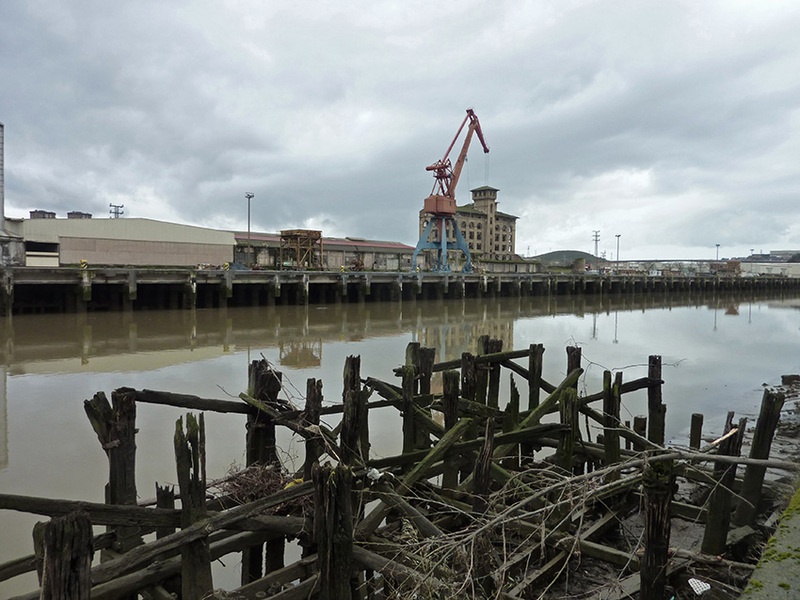 This left the area an isthmus and it will end up becoming an island. 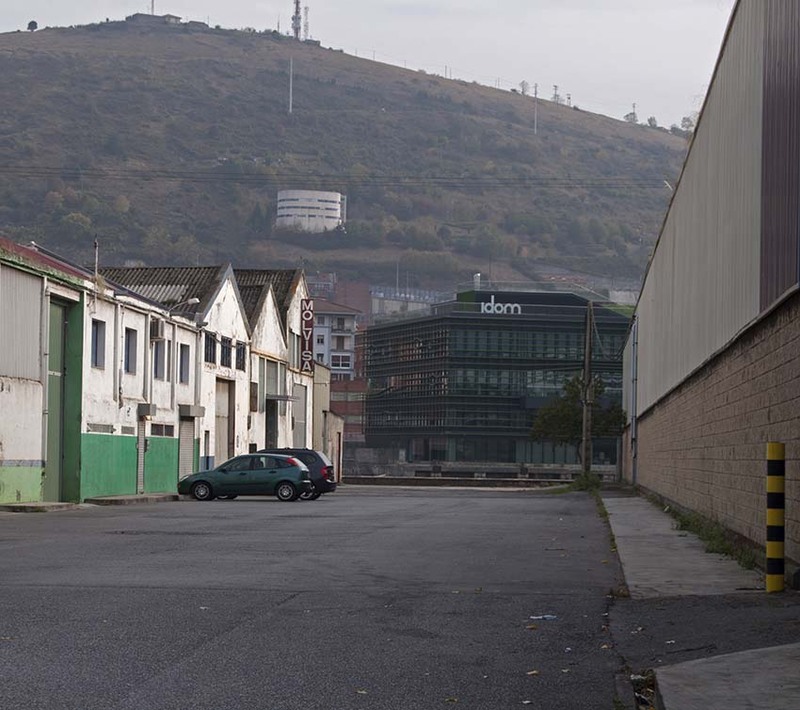 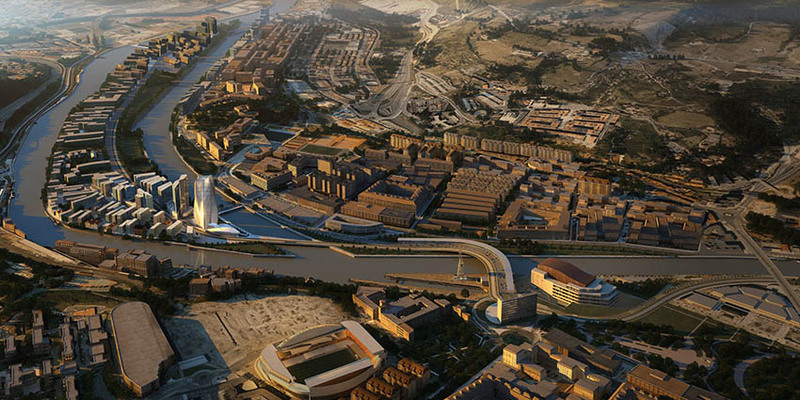 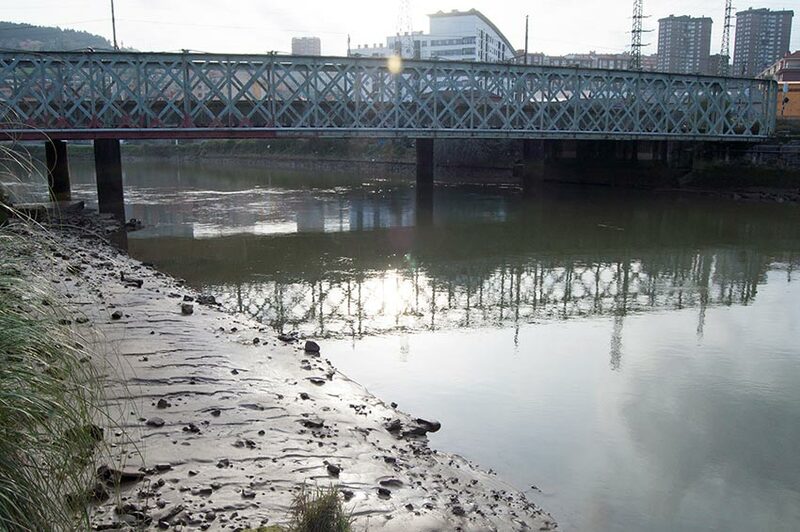 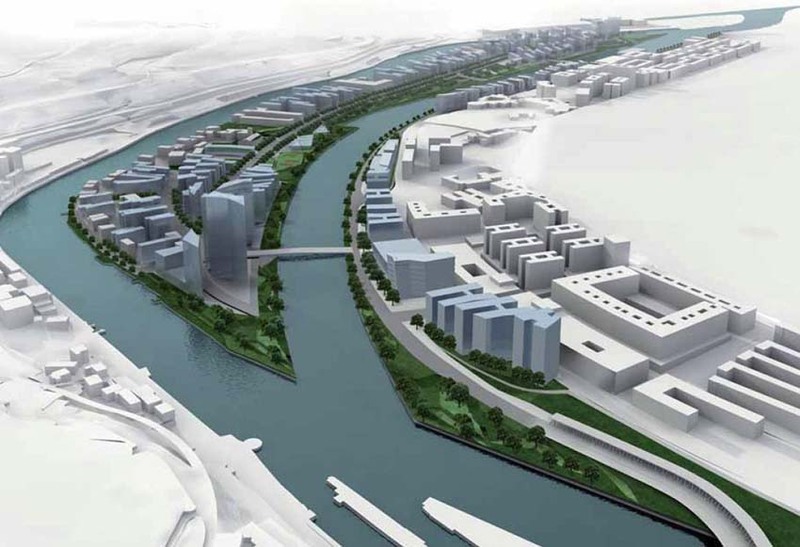 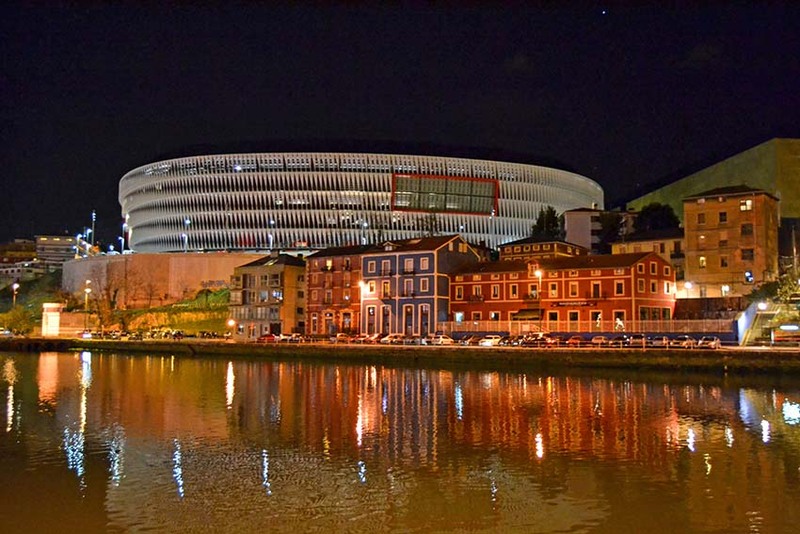 This is where Bilbao’s next big project for the 21st century will be located, turning it into a residential area and home to companies with high added value and social facilities and keeping the most emblematic old industrial buildings, in a plan designed by the architect Zaha Hadid. 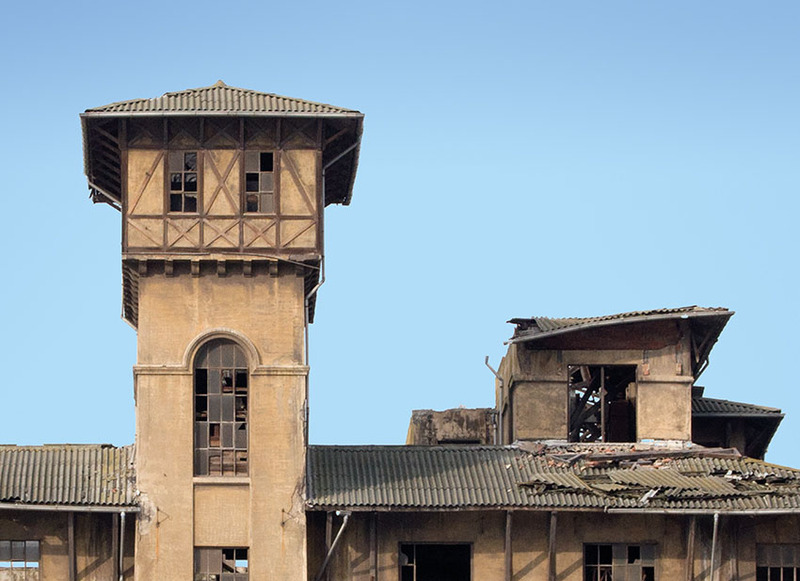 Right now it is mostly a collection of buildings in decay, ruins or mere empty sites where buildings have been demolished. 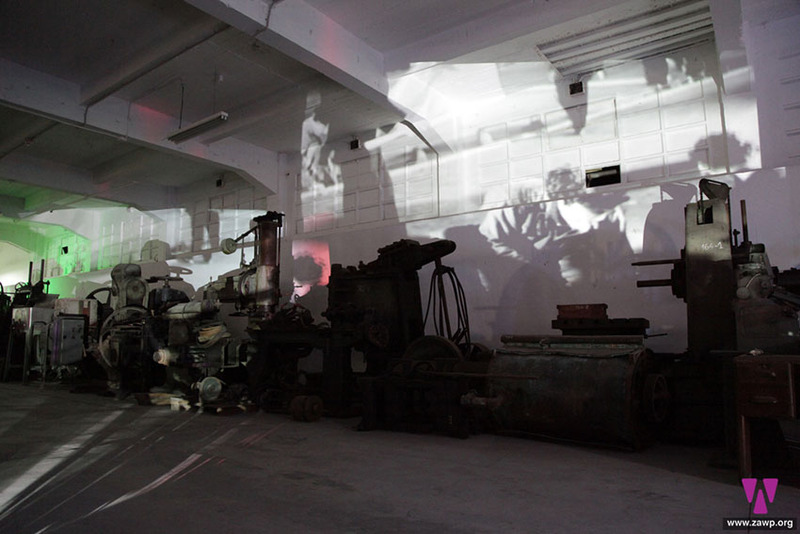 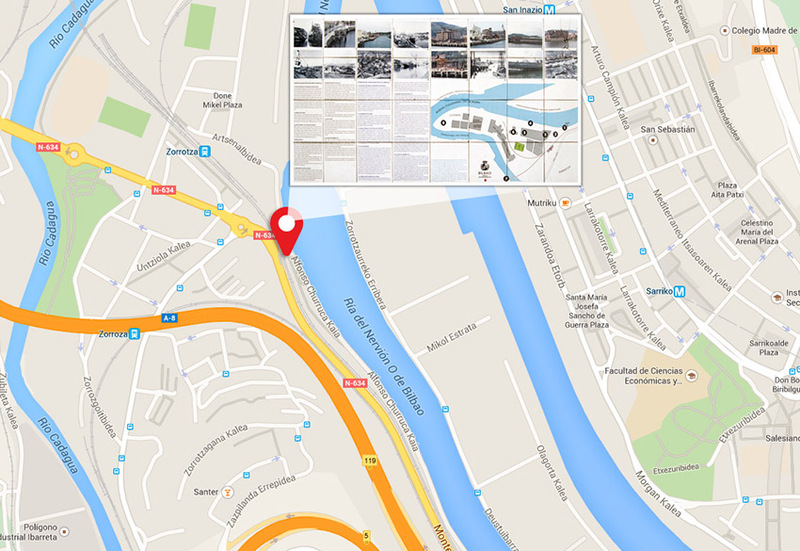 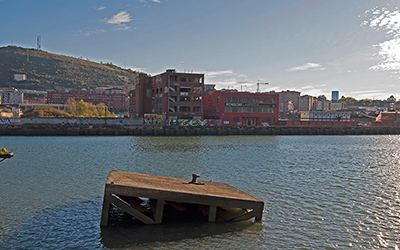 In this phase of the future redevelopment of the area, the neighbourhood known as the Ribera de Deusto hosts activities and art projects based in many of the factories that are still standing. 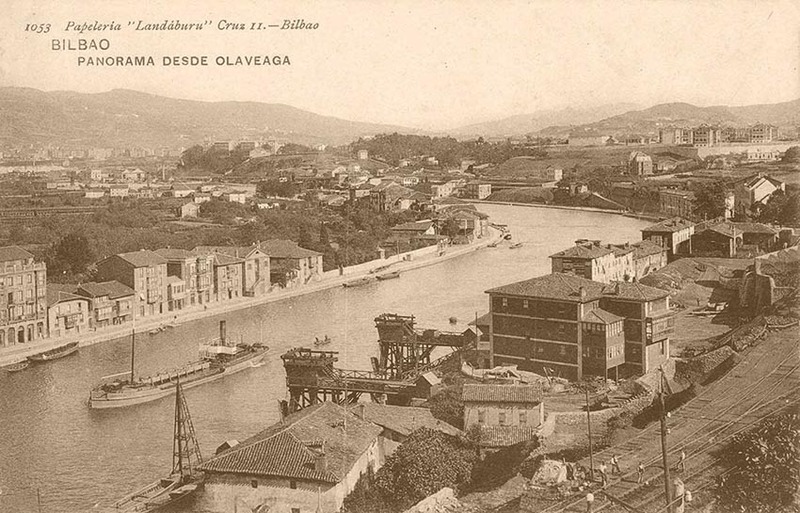 Once you have passed Olabeaga, take the riverside path that connects it to the district of Zorroza. 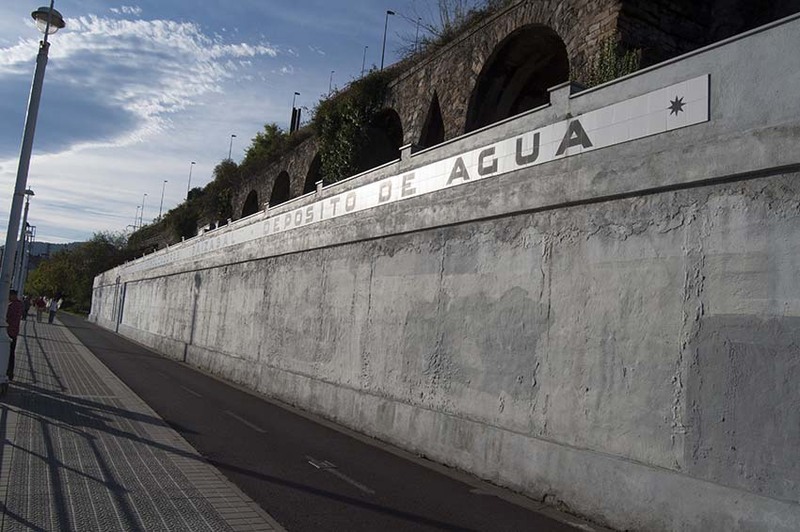 We see the first reference on the right bank, about halfway along the path from Olabeaga. 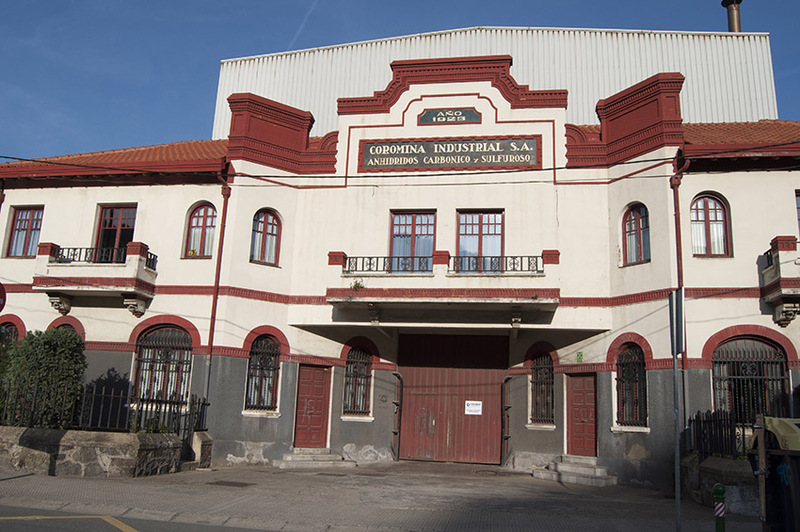 It is the Coromina Industrial factory (Spanish), built in 1923 (6). 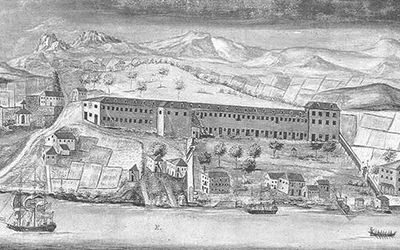 Of the 8 factory buildings which it once had, only the front building that housed the gatehouse, offices and stables remains. 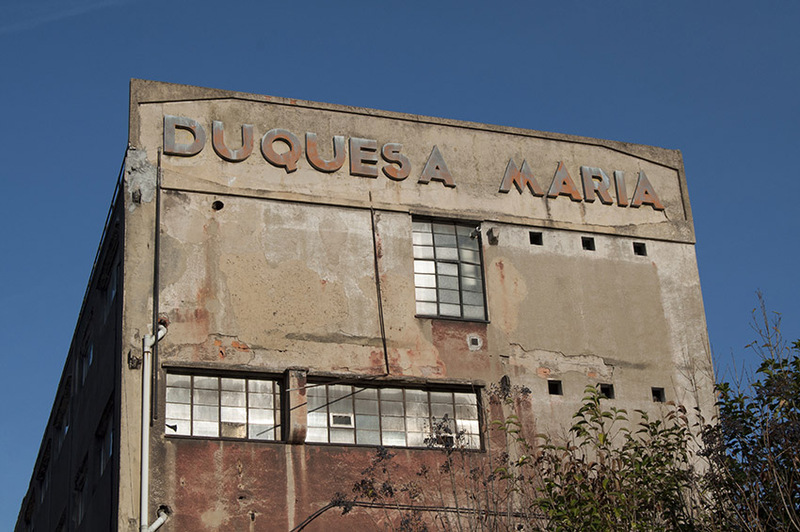 The elegant frieze of the facade was designed by architect Manuel Mª de Smith. 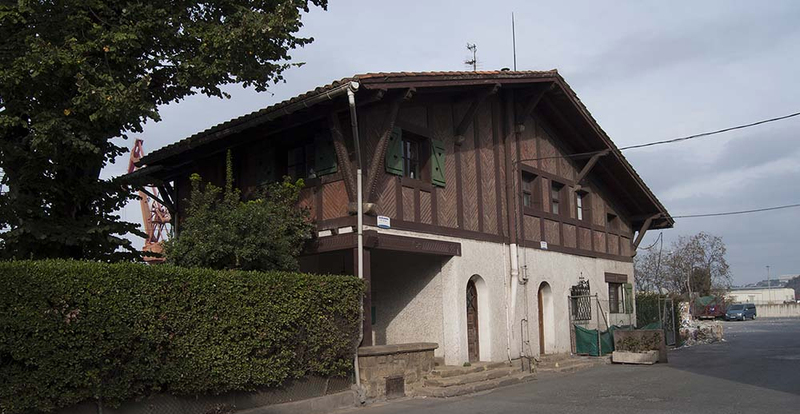 It is a single block with a gatehouse, housing for the manager on the first floor and workshops around a rectangular courtyard made of brick, plaster and tiles with secessionist stylistic references. 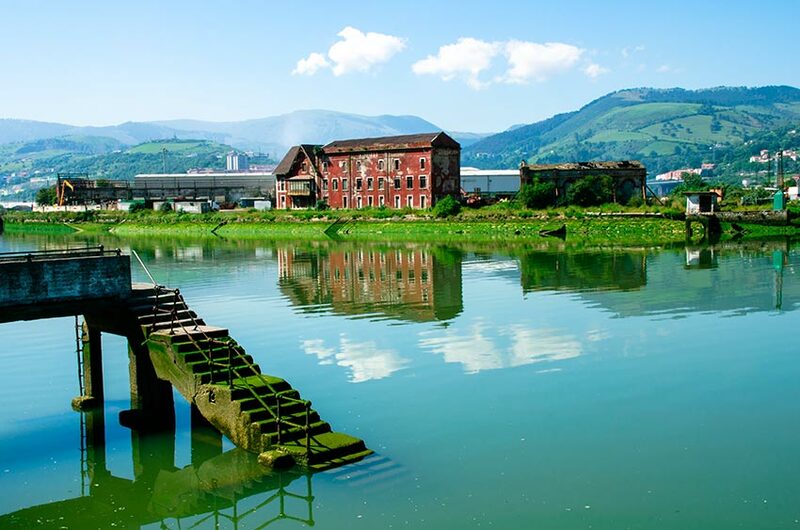 Dedicated to the production of carbon dioxide and sulphur dioxide, it was active until 1983, when it was damaged by the torrential rains. 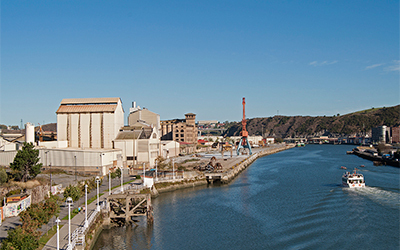 It now belongs to the mooring chains company Vicinay. 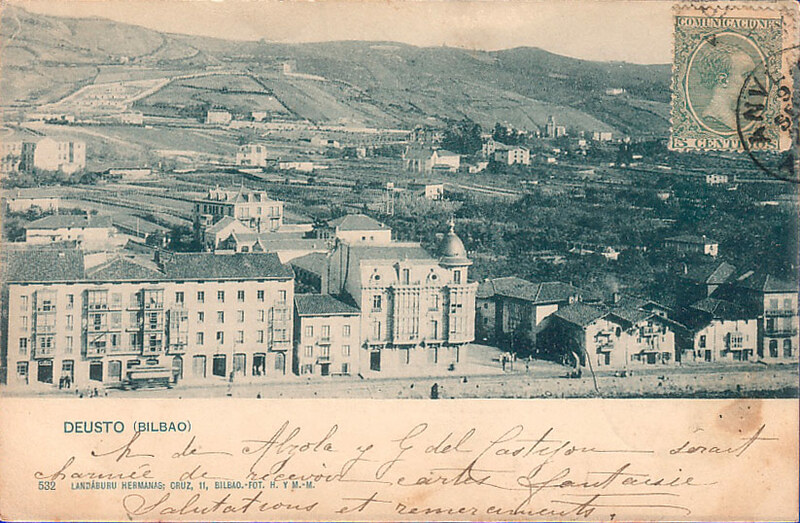 Before the Artiach buildings, you can see the Madaleno or Yandiola Palace, built in 1898 by the owners of the Aurrera de Sestao company. 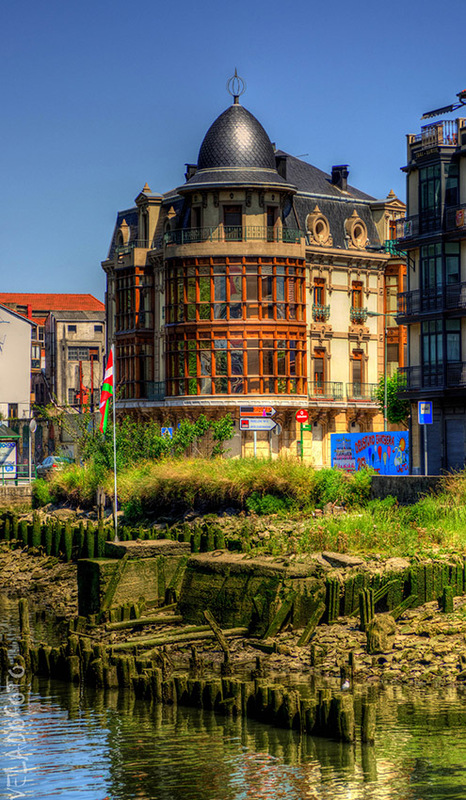 It is one of the few examples remaining of the mansions built by the wealthy families trying to move away from the overcrowded Old Quarter before moving out to Getxo. 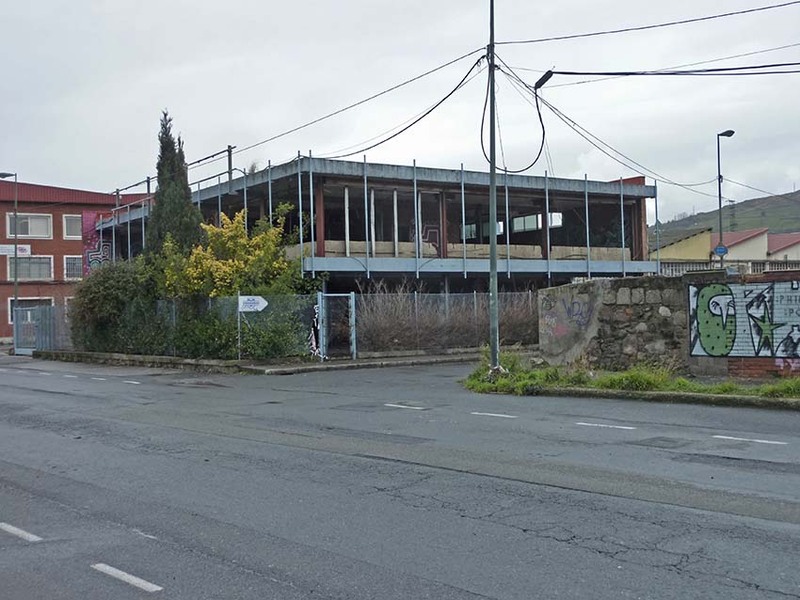 When we have left Olabeaga, 300 metres further on we see the important complex of Galletas Artiach (Spanish), consisting of 3 buildings (7). 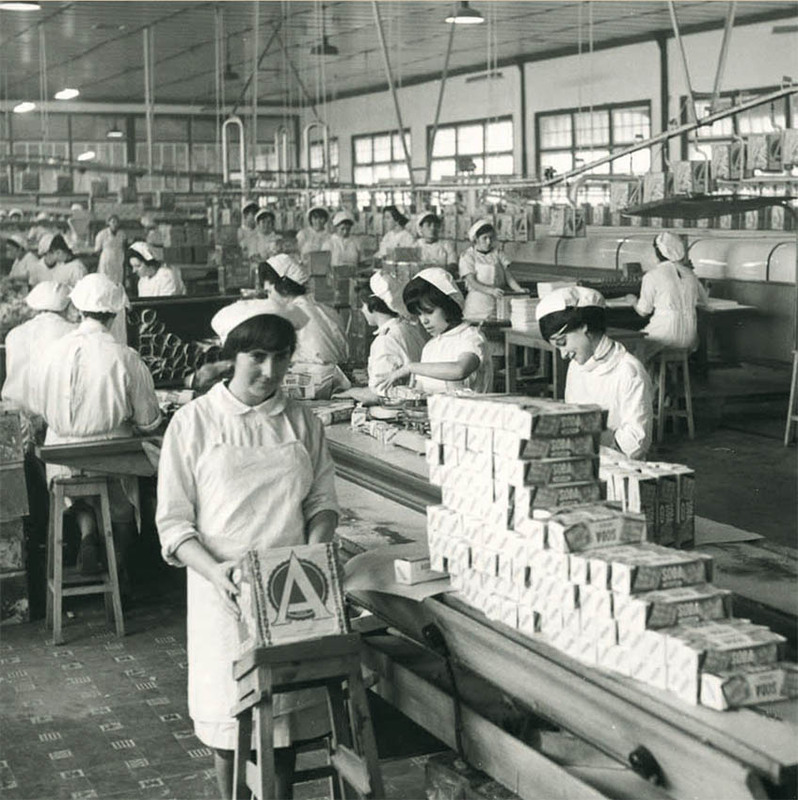 Although the factory was located here since 1921 and was the first building in the state designed to accommodate a biscuit factory, a fire in 1931 made it necessary to build a new factory. 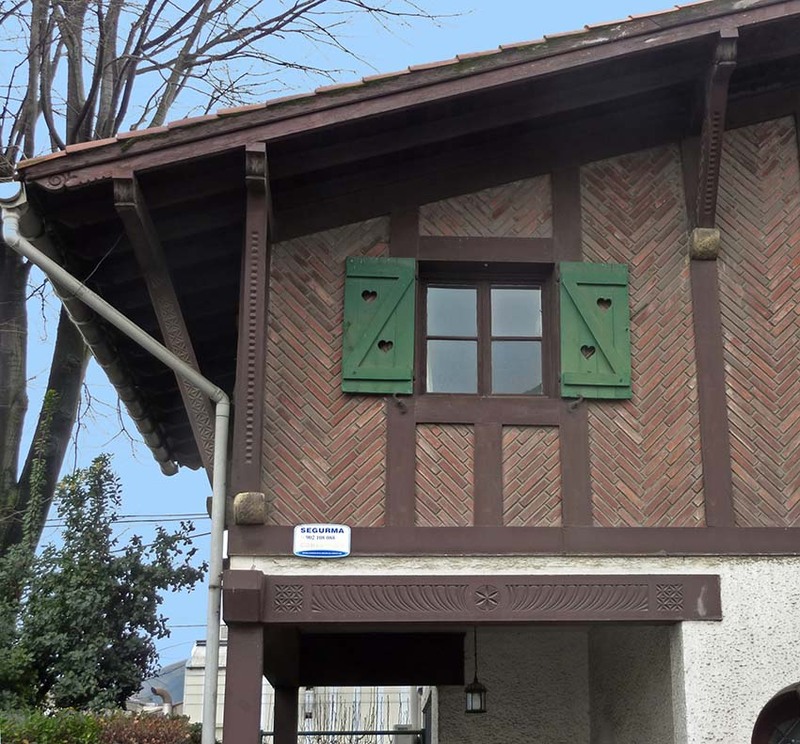 The most interesting part is the initial block built in 1937 in the classical style, also known as "the church" because of its Tuscan columns, arches and heavy wooden door welcoming people in. 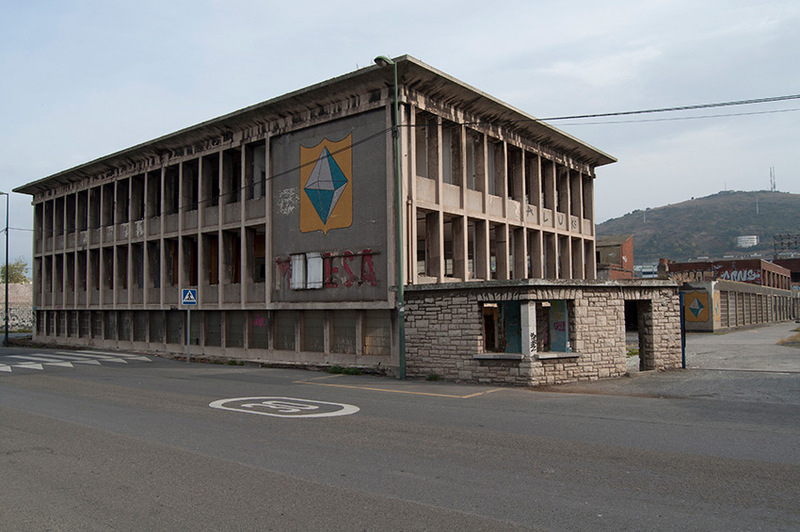 The first two floors, finished in a classical style, contrast with the austere, conventional modern style of the upper floors built in 1965. 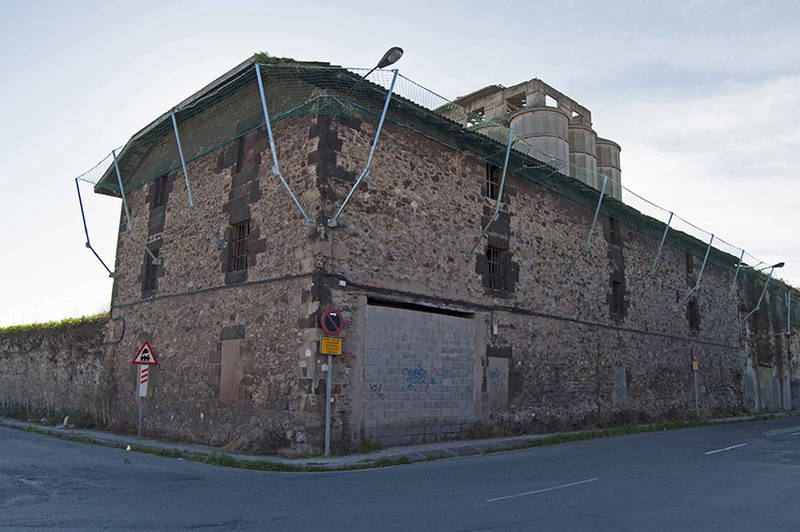 It is protected and separated from adjacent buildings by walls that form a small square in front of the factory entrance. 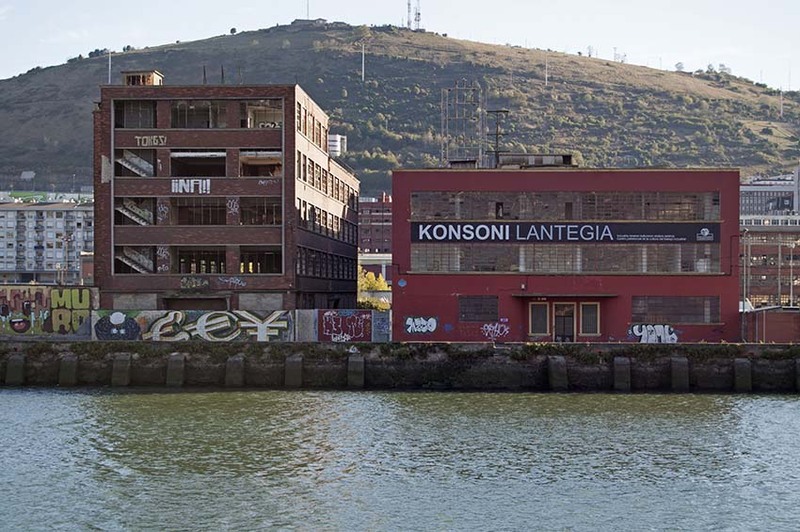 The large elongated factory, at right angles to the river, has a predominantly blind facade but is enlivened by the 96 tiny windows on each of its four floors. 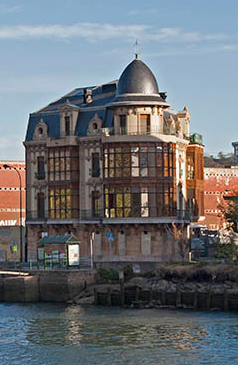 Both buildings were designed by engineer José Artiach Garate, as a member of the family of owners. 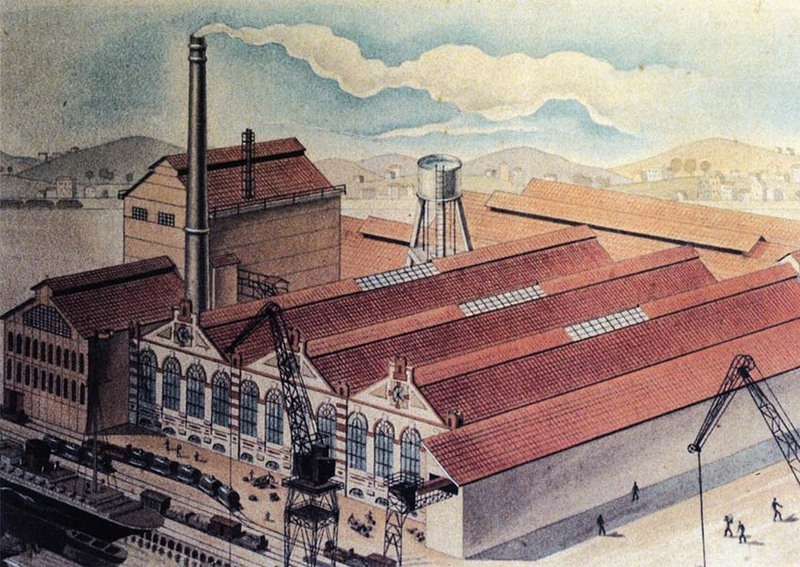 On the opposite side is an extension from modern times (the 1950s), a building faced with red brick and topped by a prominent tower. 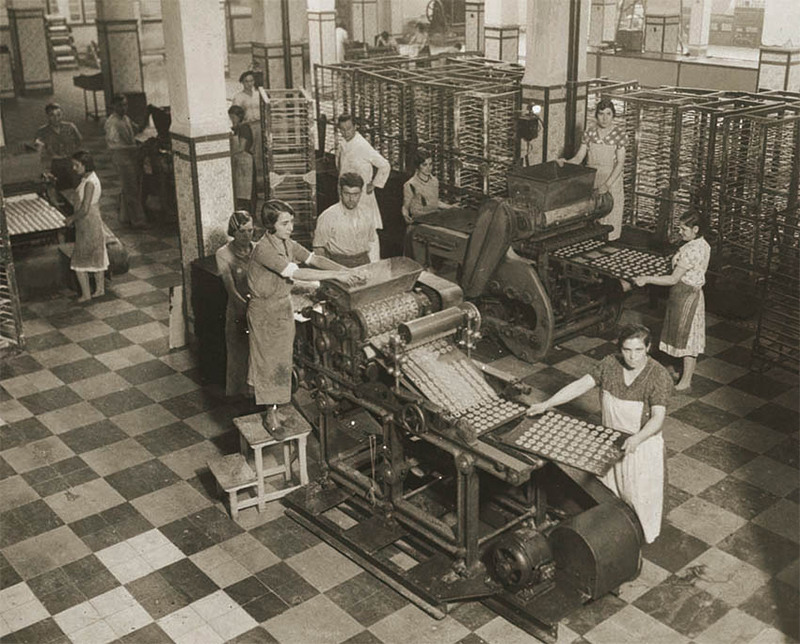 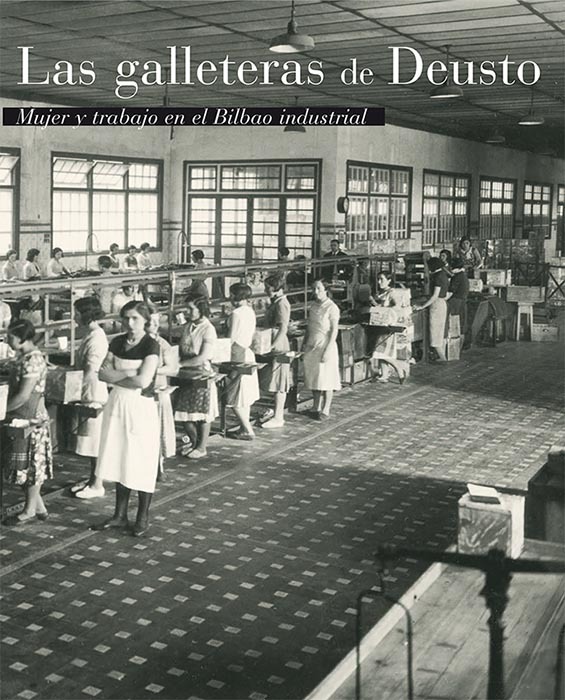 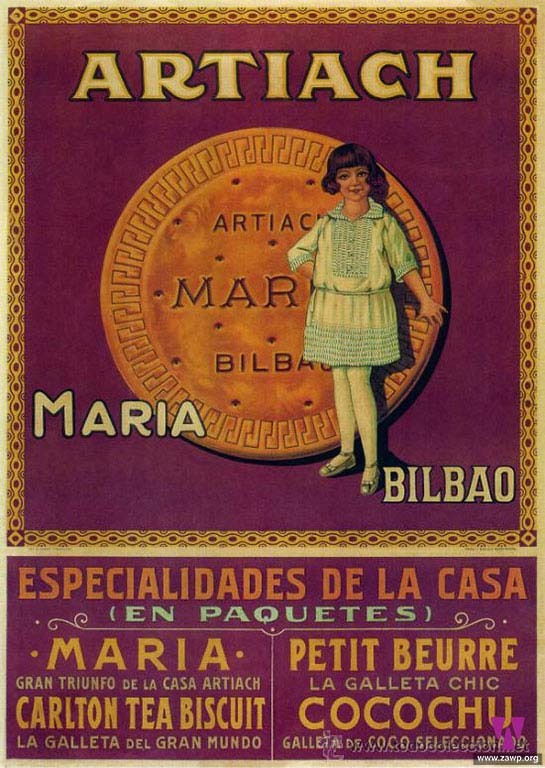 As many as 800 people worked here in the 1970s, of which 600 were women known by the nickname of "galleteras" or "biscuit makers". 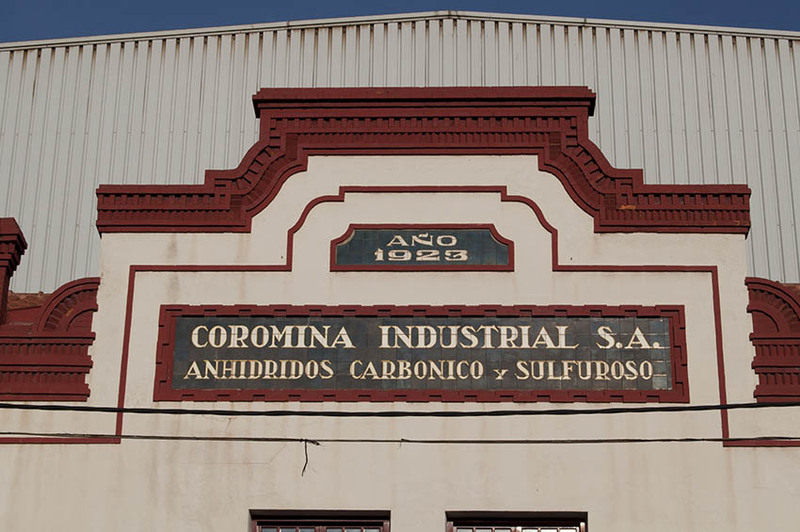 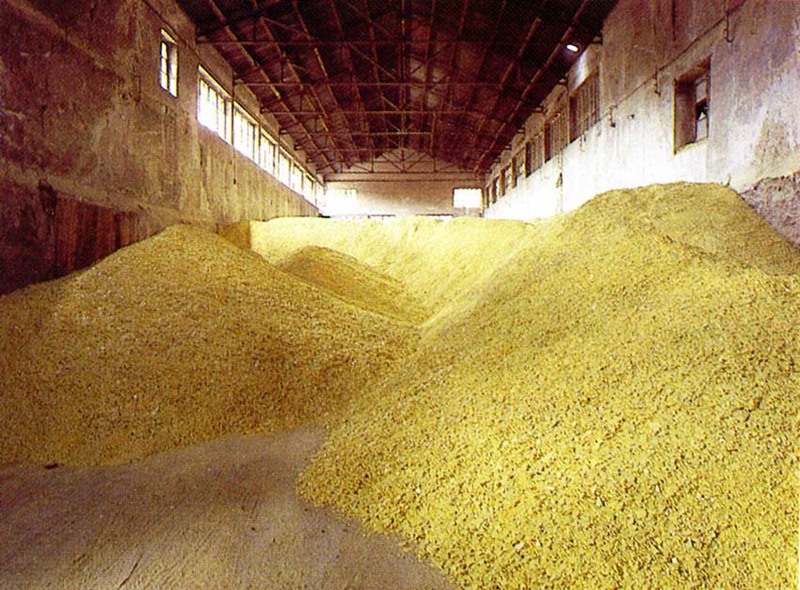 In this place, a pleasant smell of cinnamon filled the air over other more typical industrial odours. 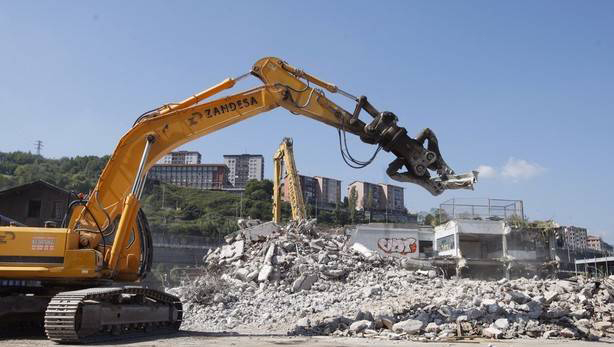 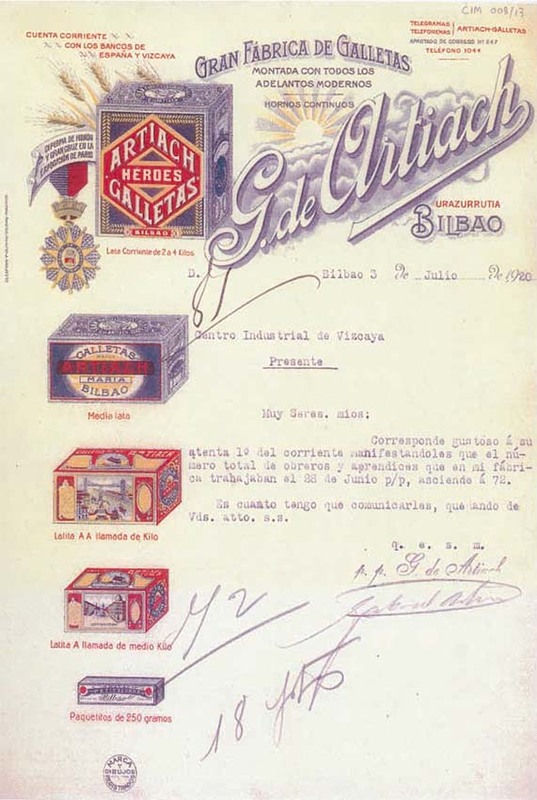 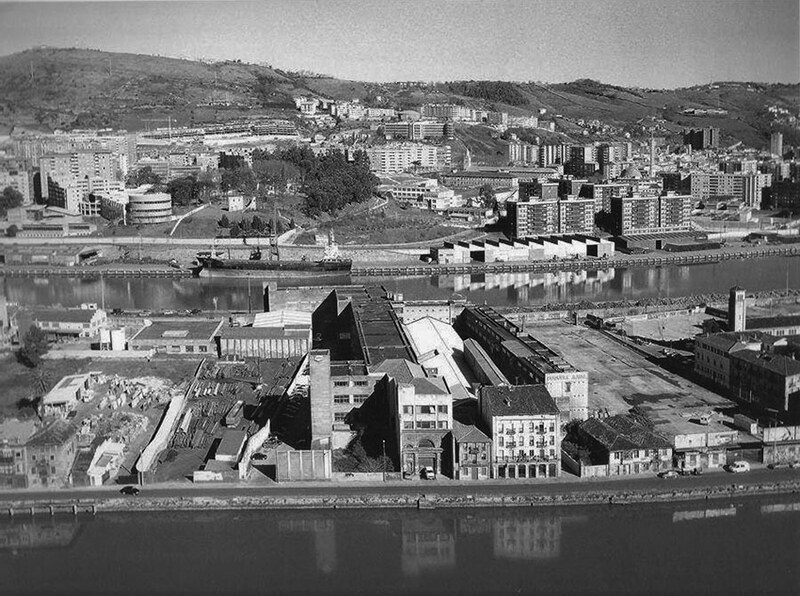 With the floods of 1983, the company went on to move its manufacturing to a new plant located in the interior of Bizkaia, leaving this building divided into workshops and various companies. 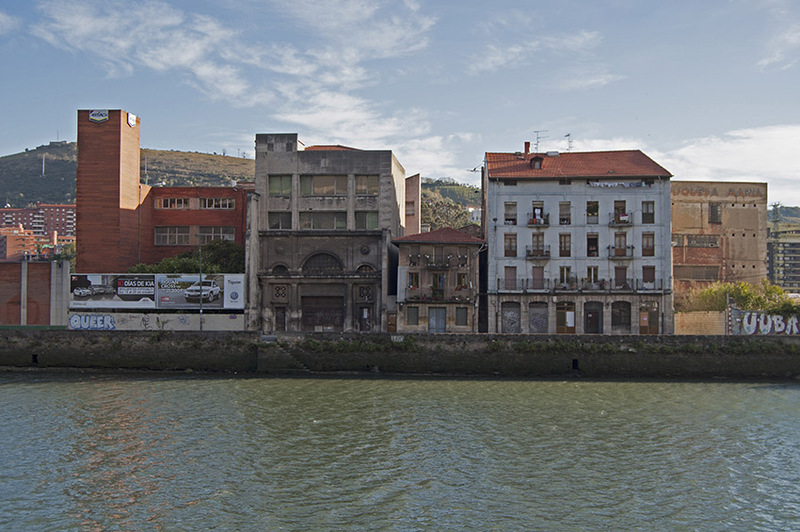 In the redevelopment of the area, this complex is expected to be kept as a Cultural Centre. 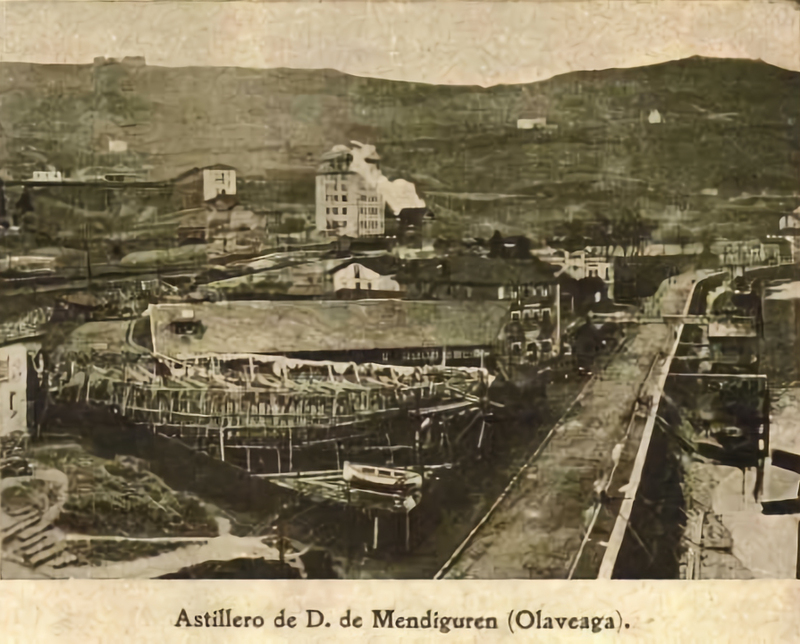 Located on this side of the river, the reservoir for drinking water called Urgozo (8) accumulated 1,800 m3 from a nearby spring which, initially, were collected in the gallery of an old copper mine. 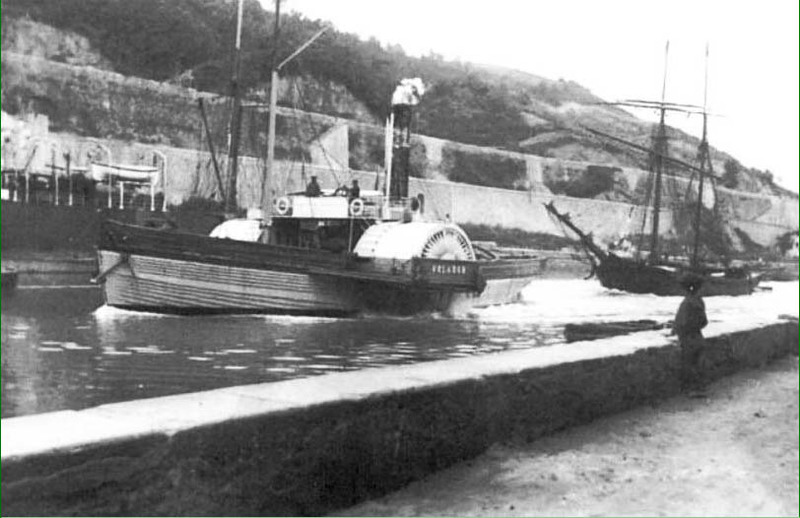 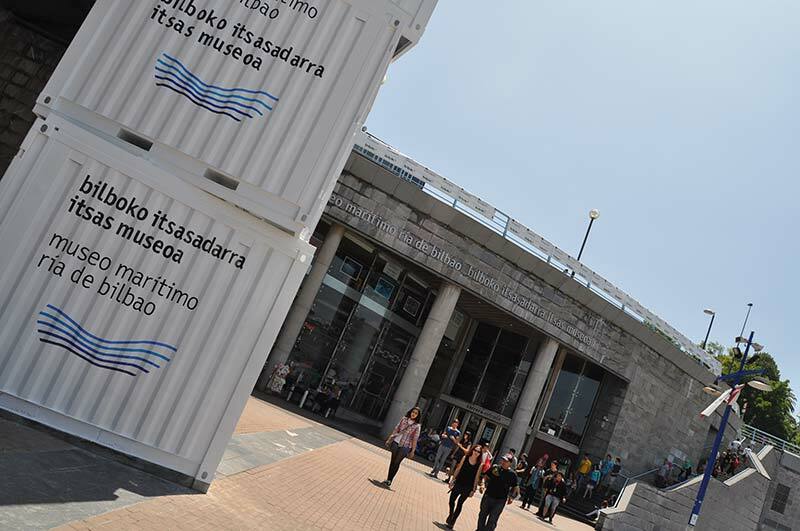 Built in 1921 to designs by Gregorio Ibarreche, it facilitated supplies of fresh water to ships that required it, using the cistern tugboat Auntz, now exhibited in the dry dock at the Maritime Museum. 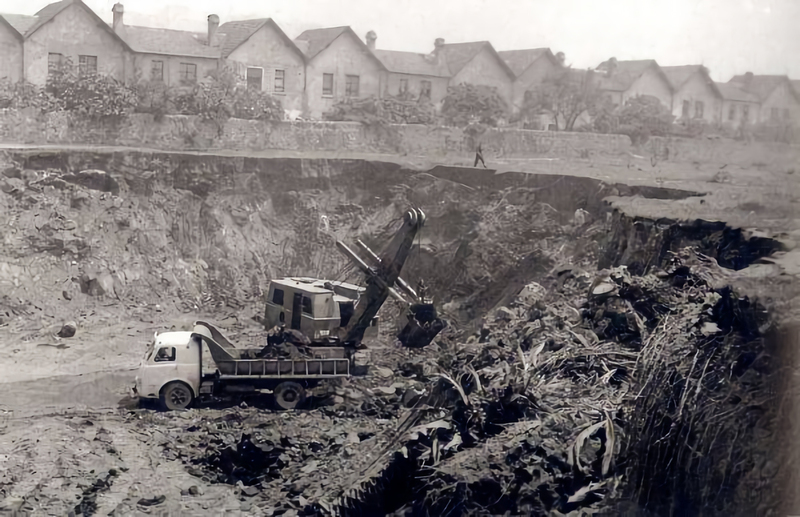 From its initial buildings, the house and warehouse next to it have disappeared, demolished in the 1990s when they had served their purpose. 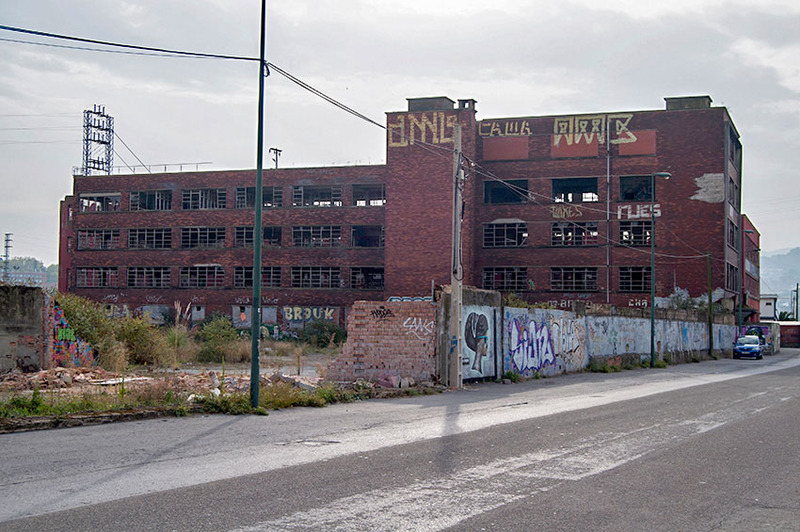 Inserted (9) into the row of houses and factories, this 1951 building will be preserved in the plan to remodel the area to house the Video game University (BETA 1) and the AS FABRICK Project (BETA 2). 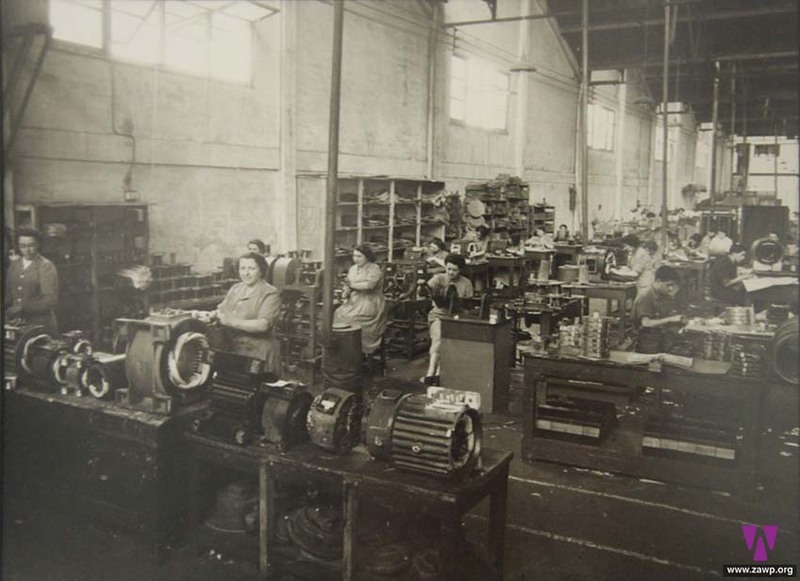 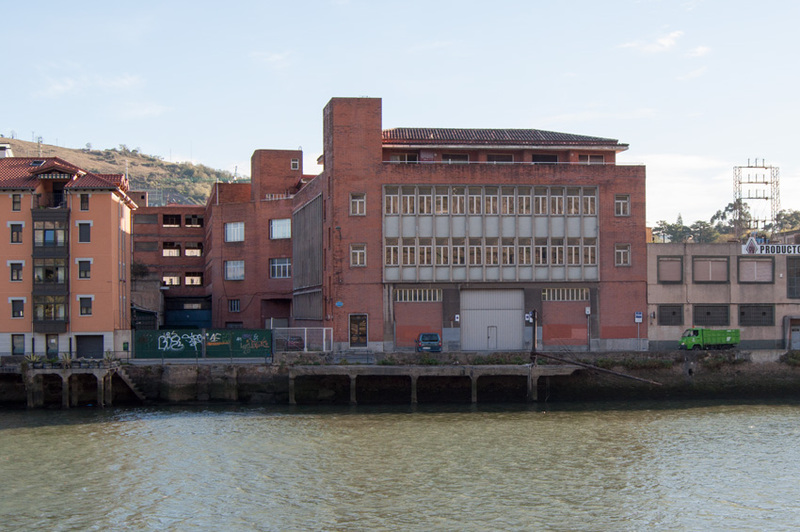 Until its transfer to another town in Bizkaia, the company was engaged in cold metal stamping in this building, which consists of a ground floor and two upper floors for production, with another upstairs floor with housing. 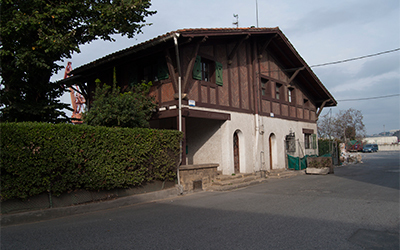 It is defined by with the prominent corner tower containing the staircase and a remarkable unevenly laid out rear extension. 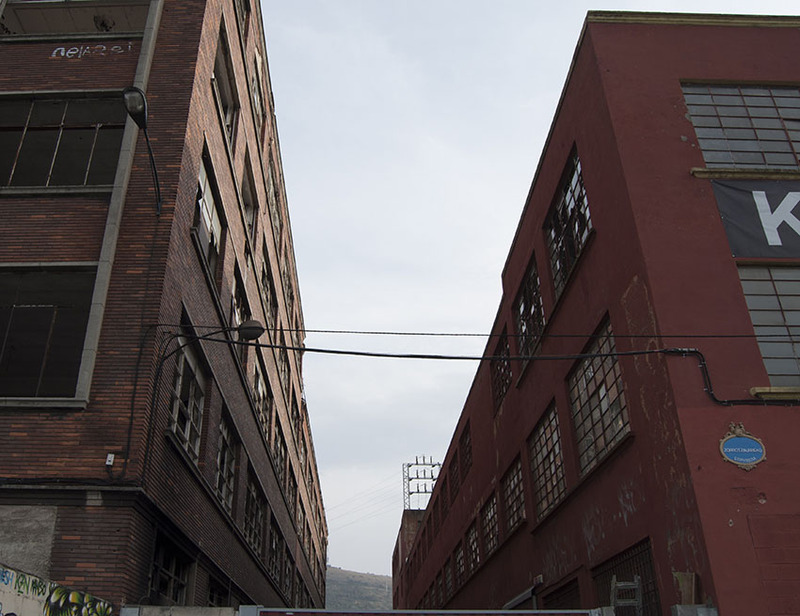 You may not find any remains of this company by the time you do this walk (10). 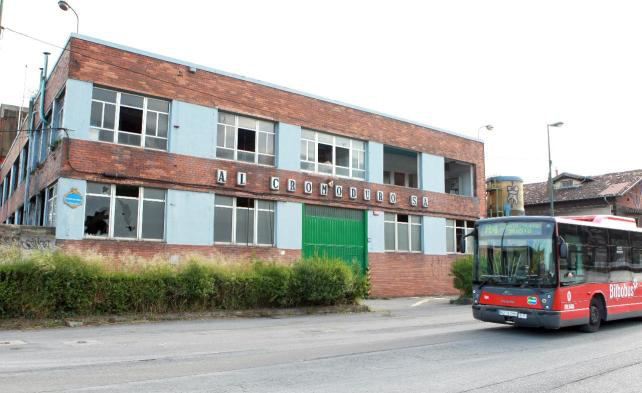 Today, the only part still standing is the gatehouse and, separated by a plot of land, the skeleton of the former offices of the company, which produced plastics. 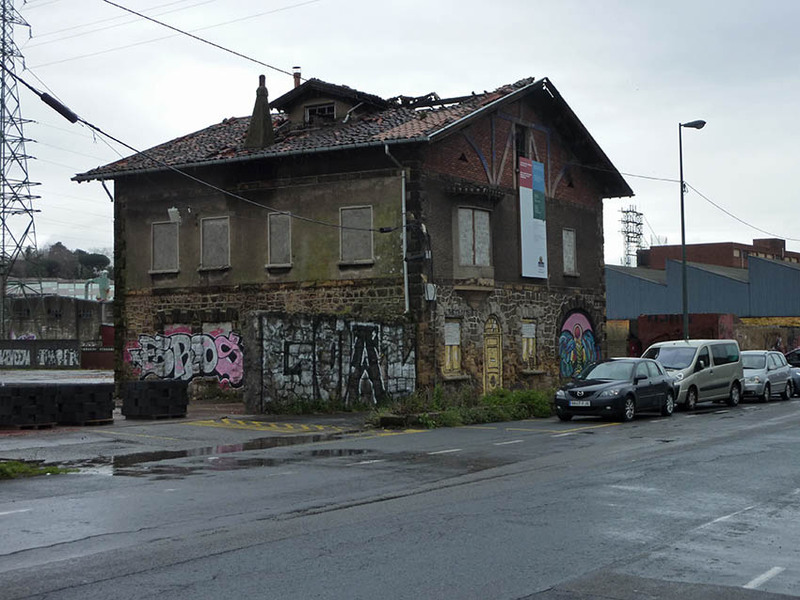 The gatehouse was in fact part of a wood company that was designed by Manuel Galíndez at the beginning of the century and it uses this material extensively in this building, as he would do in the Maderas Españolas building 800 m further on, which is much better preserved. 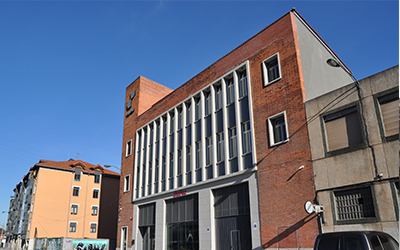 The old offices, in operation until 2010, were the work of Juan de Madariaga in 1969. 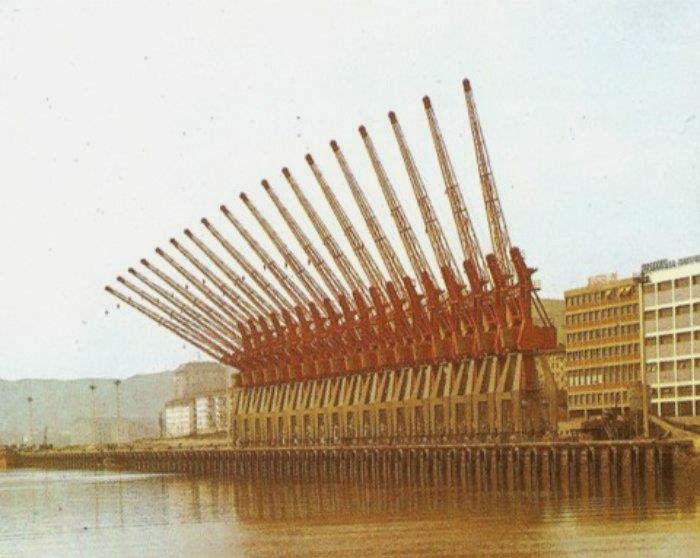 They were part of a new concept of industrial architecture which emerged around 1970. 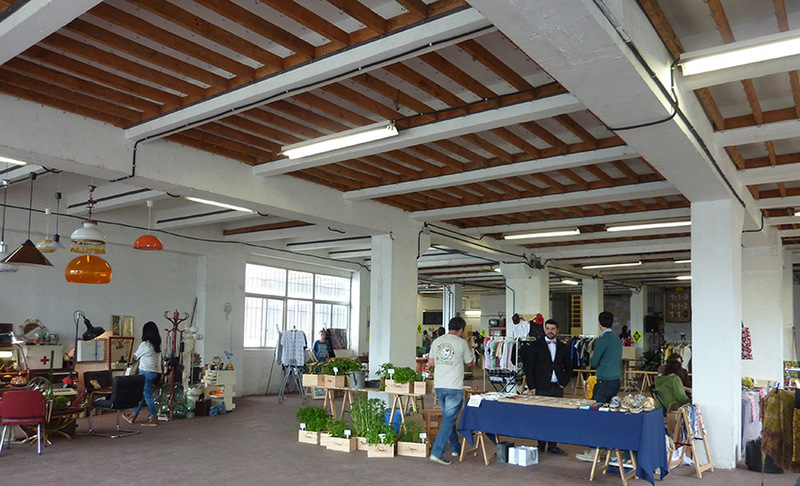 It was a very impressive two-floor building. 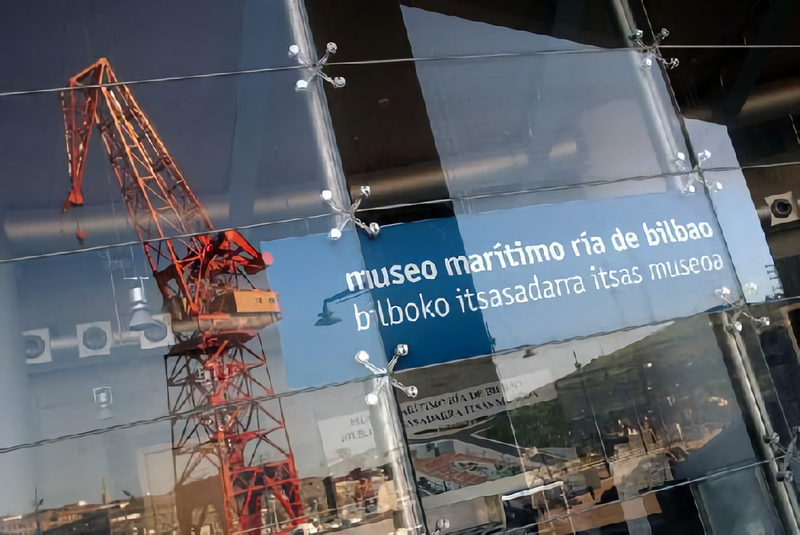 Supported by a metal frame with two powerful structural lines for the main roof frame and the roof, the front facade is inserted, between them, less visible and totally made of glass. 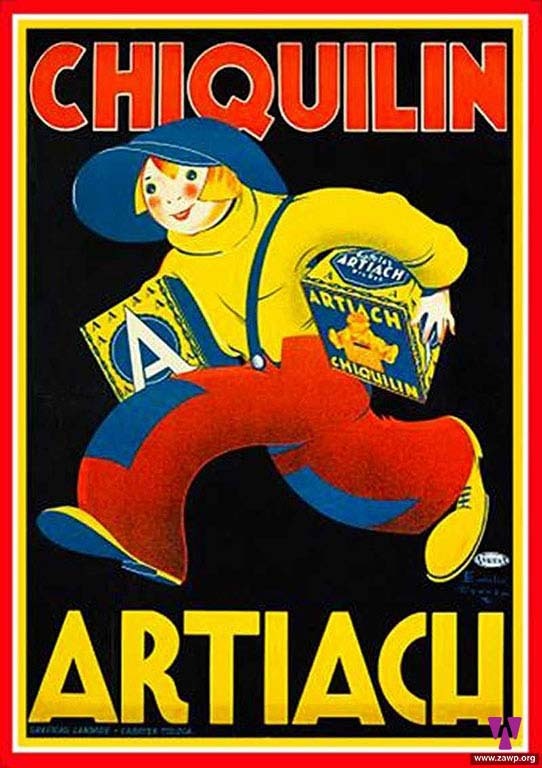 This is a style that is highlighted on the outside sign, which is interesting for its font. 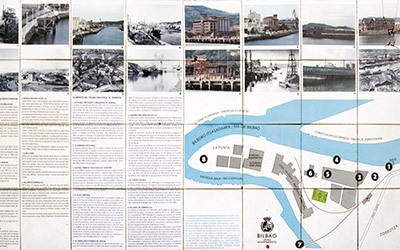 These are two different ways of understanding the architecture of the 1950s (11). 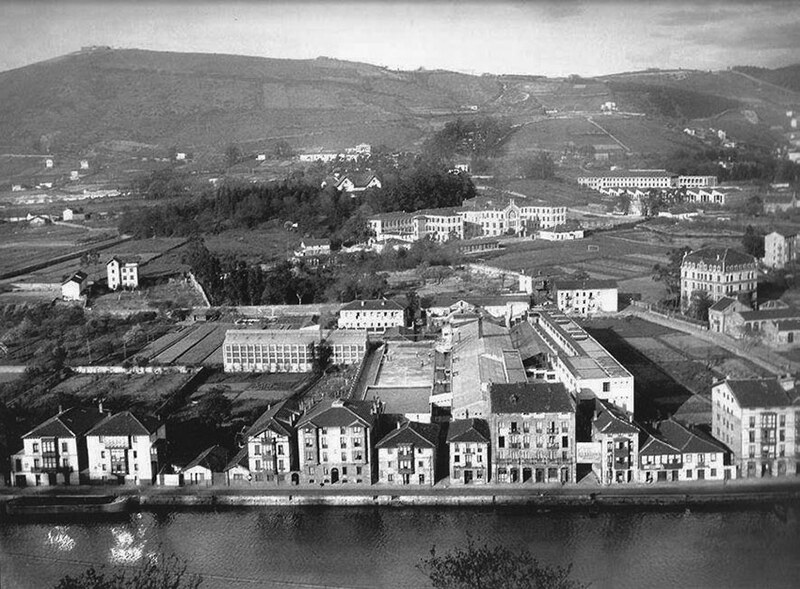 Although they are next to each other, first we see the building of Termoelectricidad Consonni (Spanish), where resistors were produced. 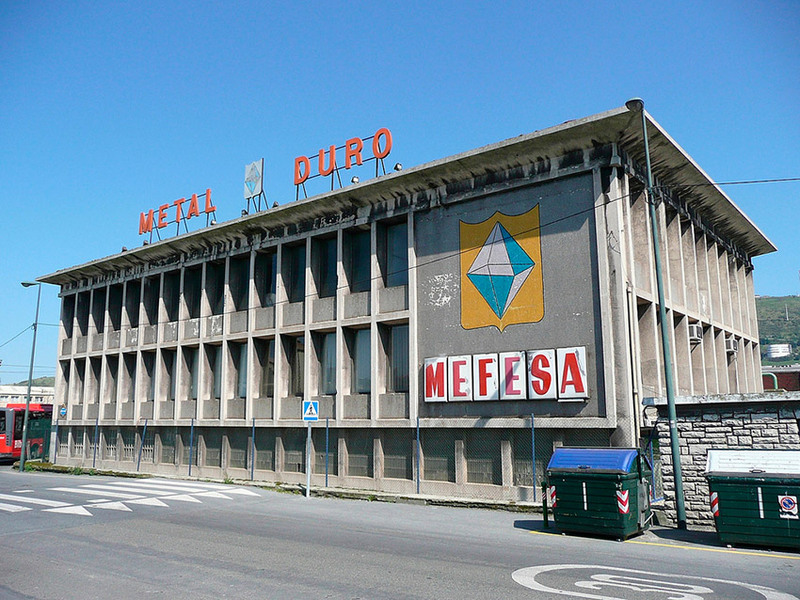 This is a beautiful factory building, built in 1957 and finished on the ground floor and two upper floors with a neat, elongated, elegant glass front that dominates almost all of its facade. 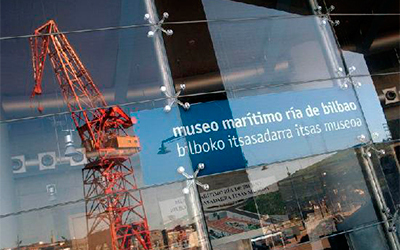 It is being considered as a future Museum of Technology and Industry to hold all the major industrial collections in Bizkaia. 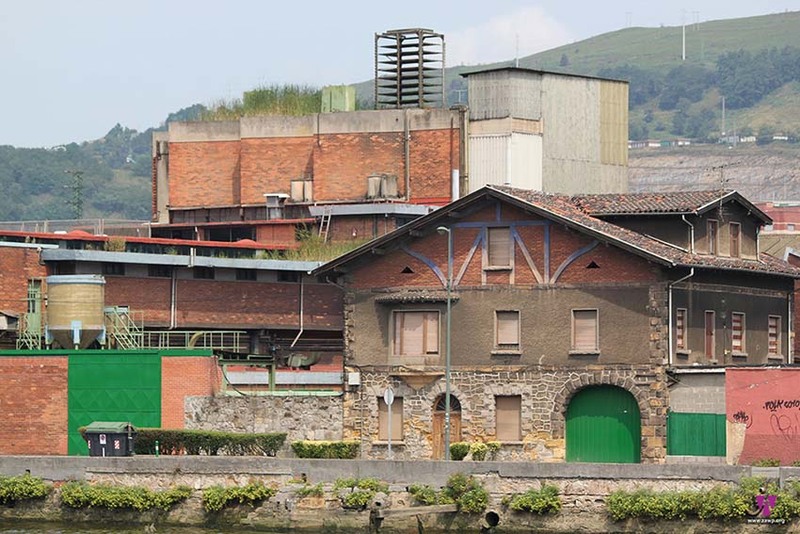 Separated by a narrow yard with a distinctive factory air to it was Elorriaga Industrias Eléctricas (Lancor). 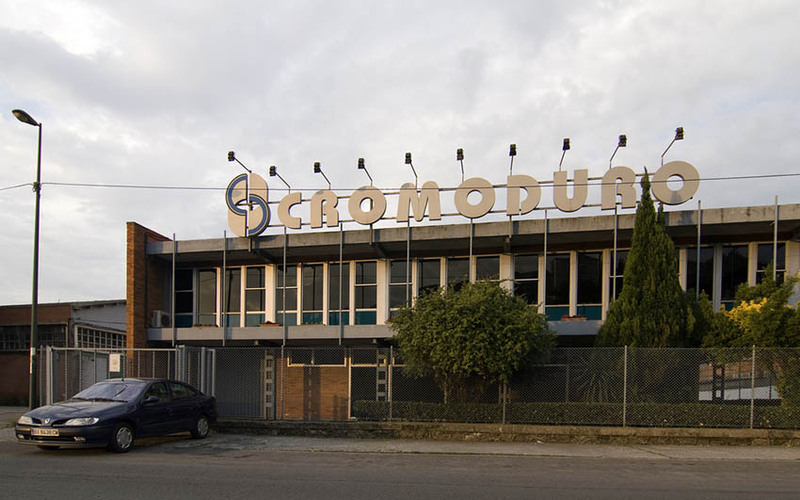 This was a production complex built in 1958 with a vertical style of ground floor and four upper floors of reinforced concrete covered with dark brown brick, with a very balanced proportion of windows and walls, in which the stairwell of the facade is an iconic element. 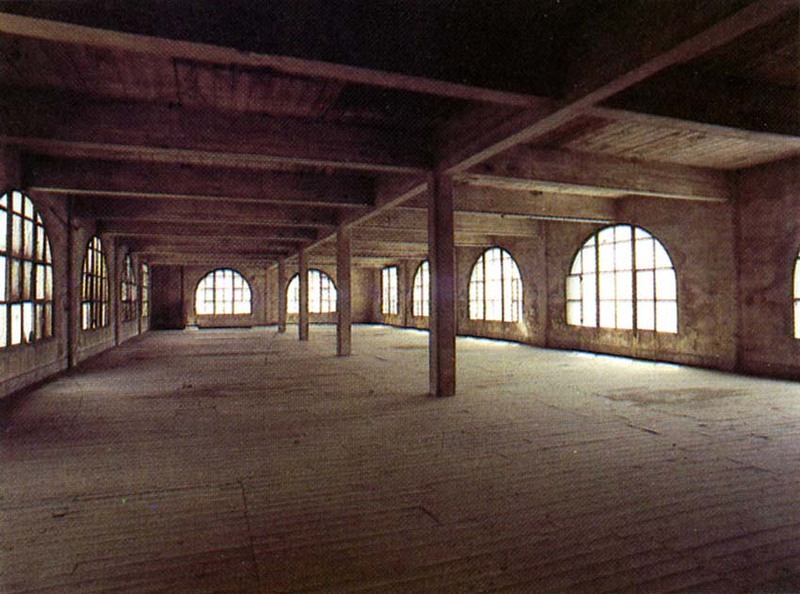 It was abandoned in 2000. 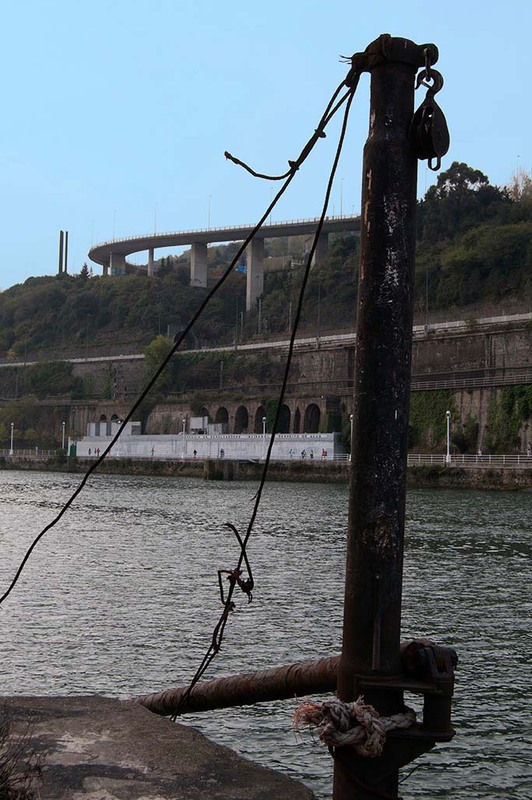 One hundred metres further on we see the last industrial complex visible from the shore we are walking along (12). 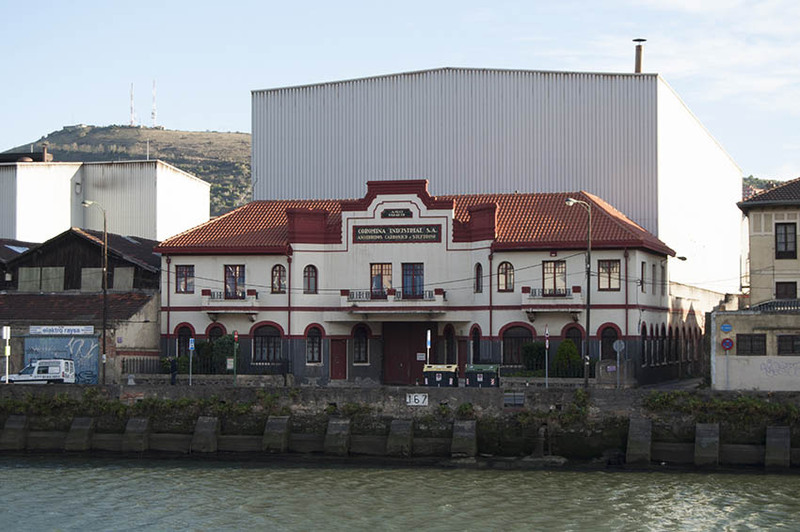 This is the metallurgical company MEFESA, an industrial complex overlooking the river where you can still see the office building designed by Luis Mª Gana in 1962. 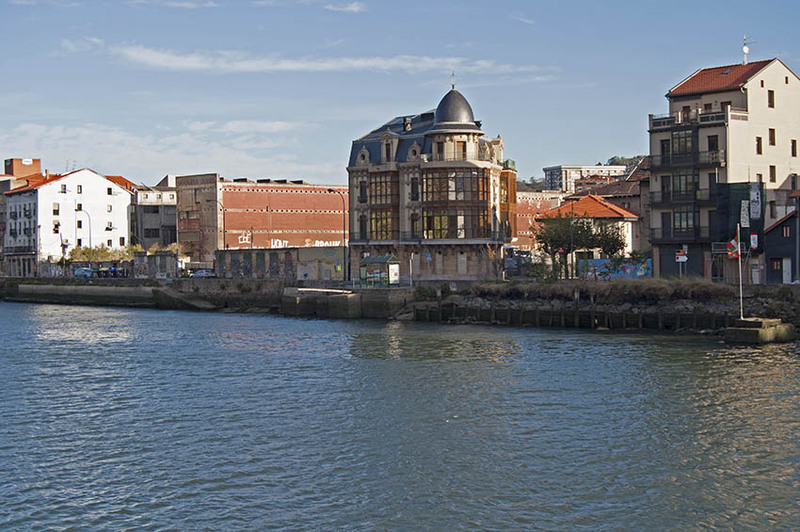 It is very interesting for its spatial organization, with its three floors that have a rhythm of windows between remarkably expressive concrete frames and the front, which is covered with glazed cladding. 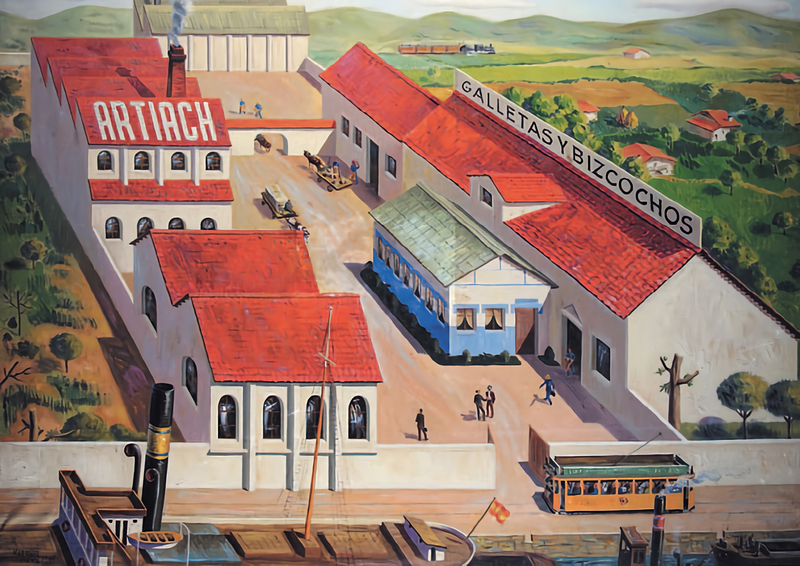 It is a remarkable composition that fitted in with the stylistic criteria of the moment, an opening onto the international vanguard, and with the factory building at the end as powerful industrial testimony. 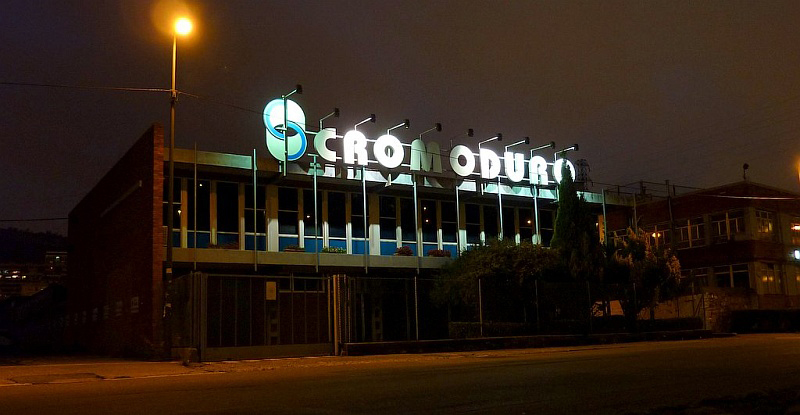 With the diamond-shaped logo on the office building, the laboratories and chemical processing tower, which is very high, it was destined to become "an architectural landmark." 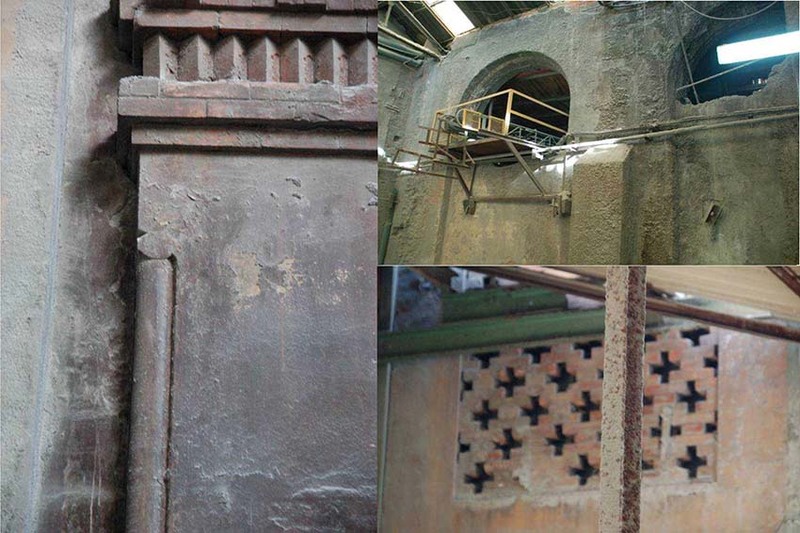 Its inner set of tanks and hoists for treating the metal make it simply "a building-machine, an industrial sculpture". 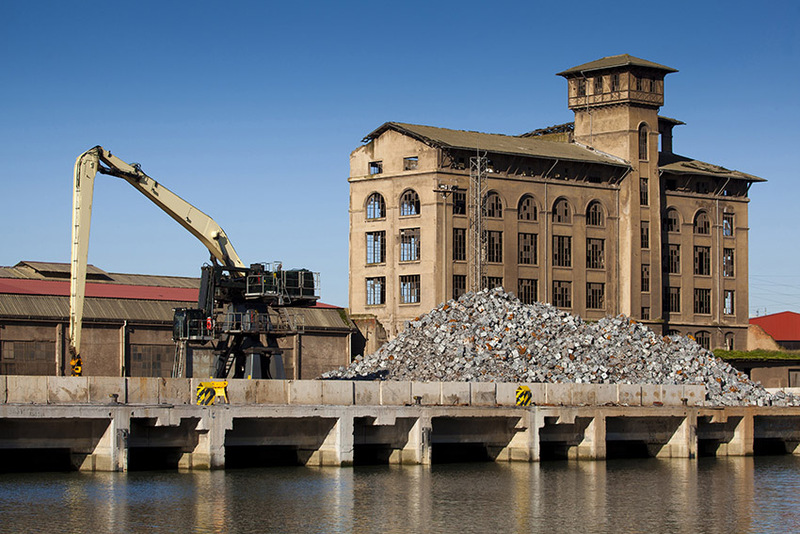 On our walk along the Alfonso Churruca quay you can see the remains of old loading bays and some explanatory panels about the area and its industrial facilities. 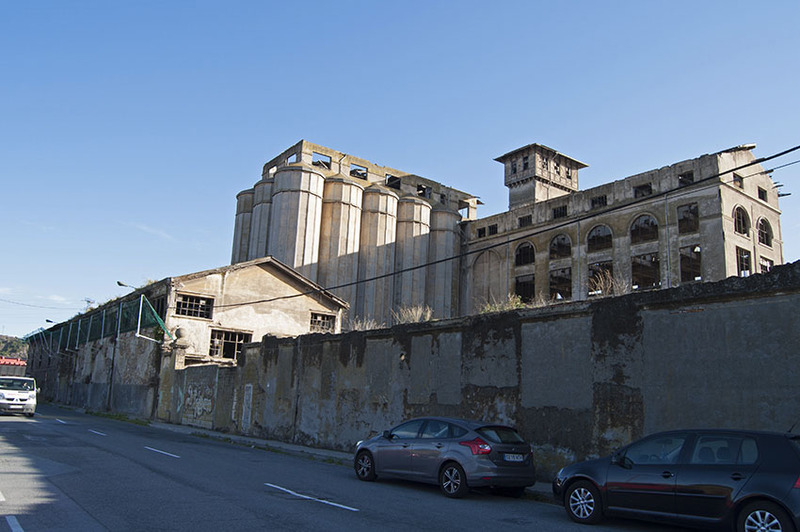 But nearing the end of the pedestrian route and going round the first industrial facility we approach what is the jewel of this walk: the abandoned Molinos Vascos mill building. 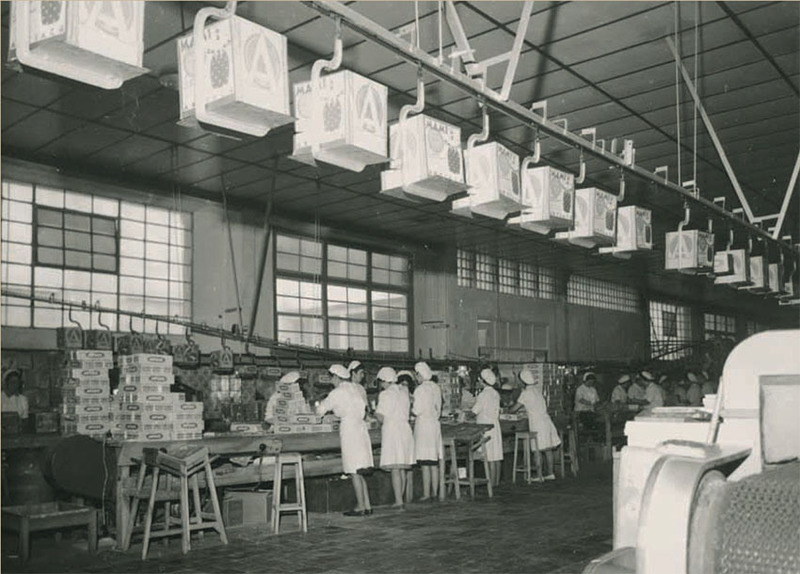 Before the flour mill we can see some industrial facilities surrounded by galvanized tin sheeting. 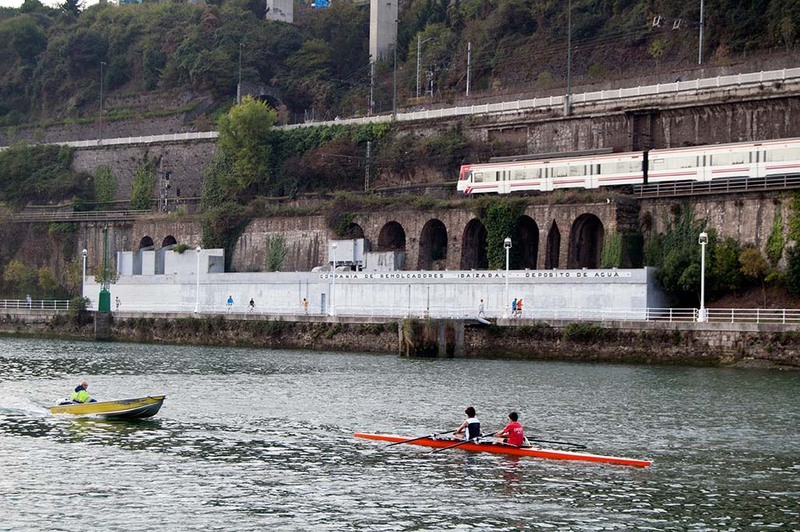 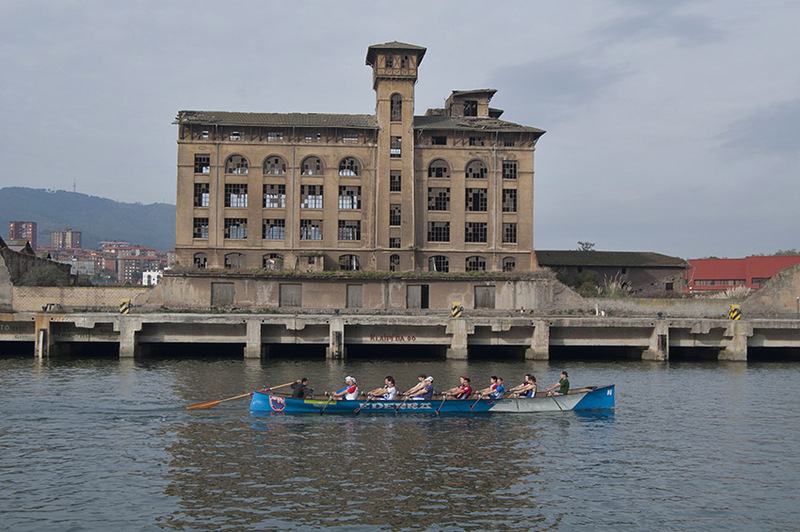 They occupy the buildings of what used to be Electra del Nervión (14), the first electricity power plant in Bilbao, which was founded in 1894 and brought electricity to all the towns on both sides of the river. 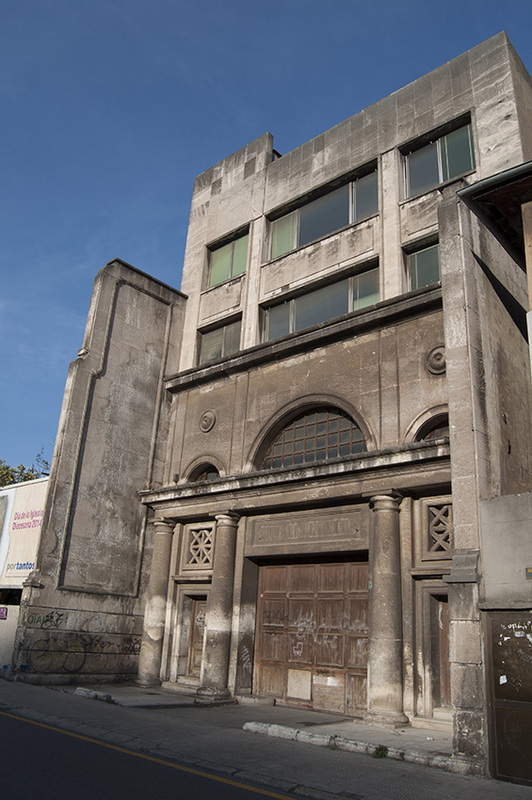 Under its nondescript fencing are the original facilities that can still be seen; the halls and deep hollow spaces within, with their semicircular arches and brickwork friezes. 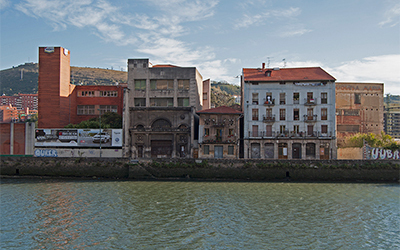 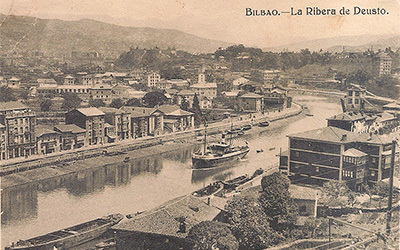 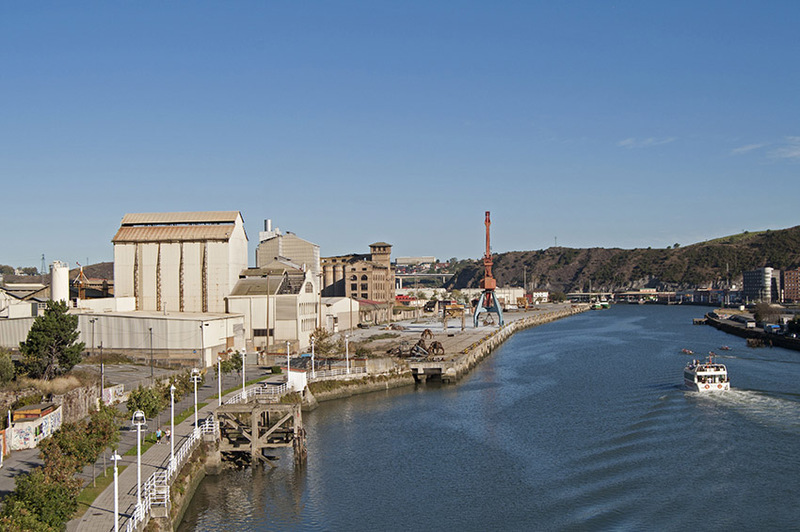 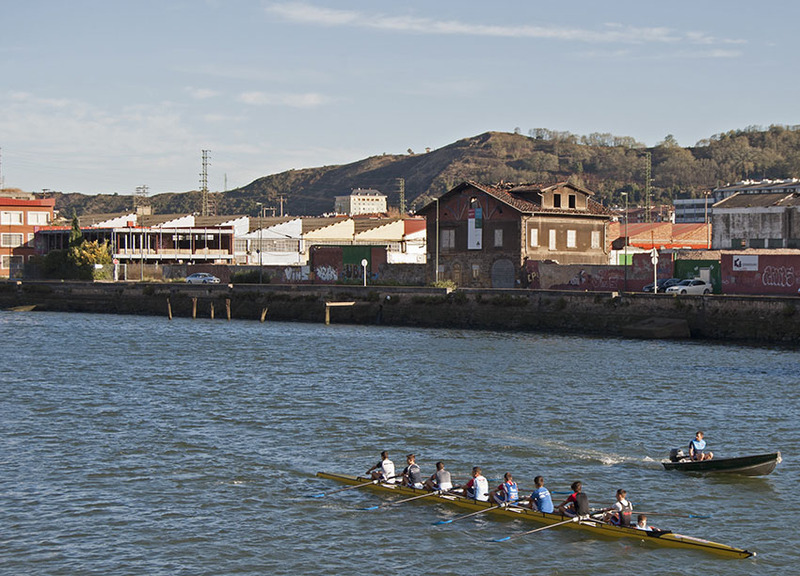 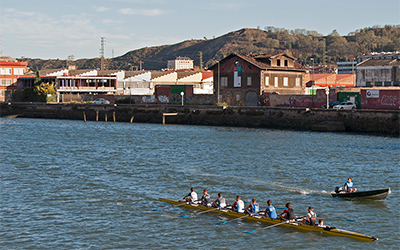 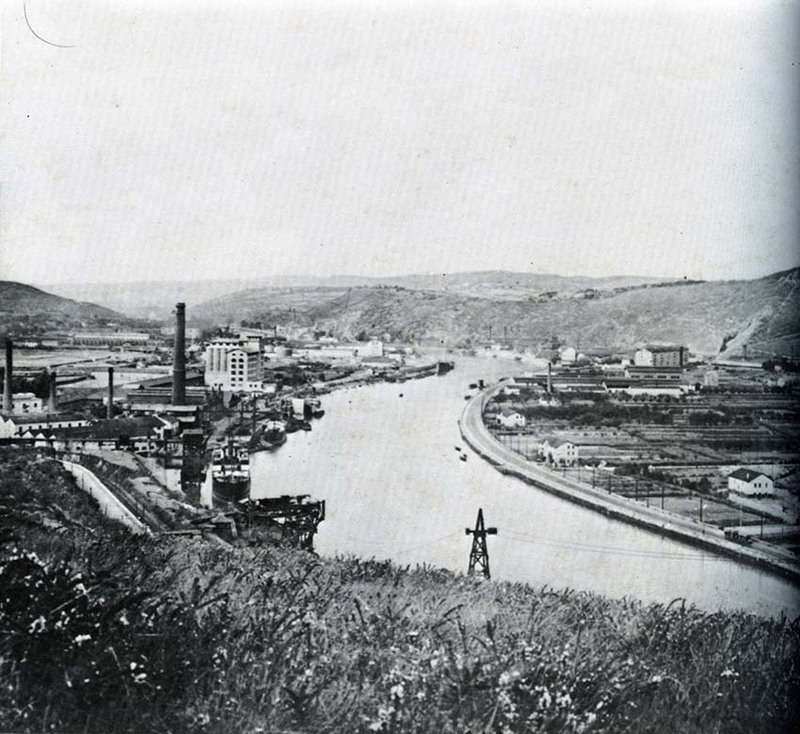 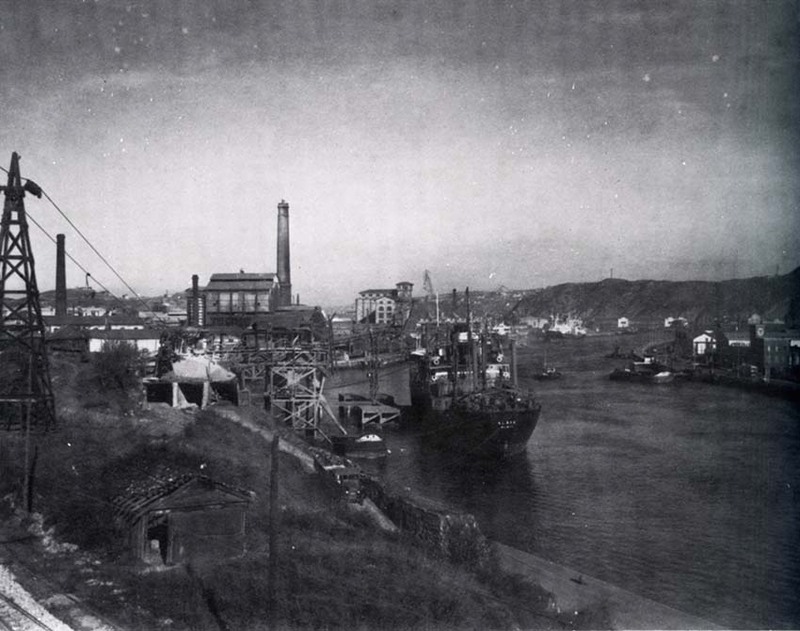 The surviving factory buildings are among the oldest industrial buildings on the river in Bilbao and one of the few examples of "cathedral factories" left standing. 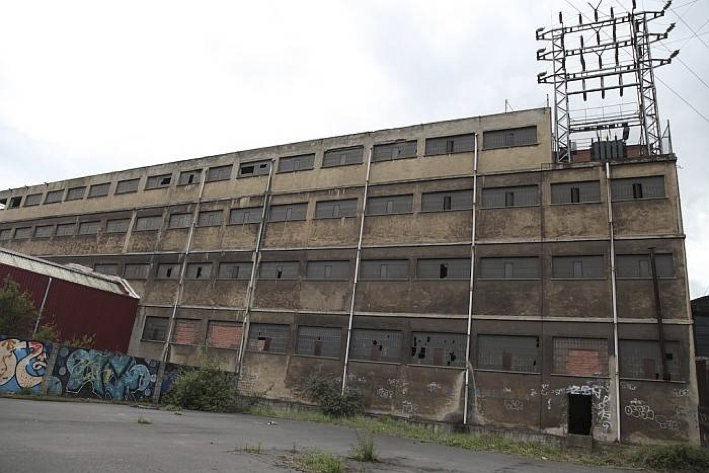 It originally occupied 3 halls, a boiler building with a chimney 63 m high, now demolished, and a transformer room. 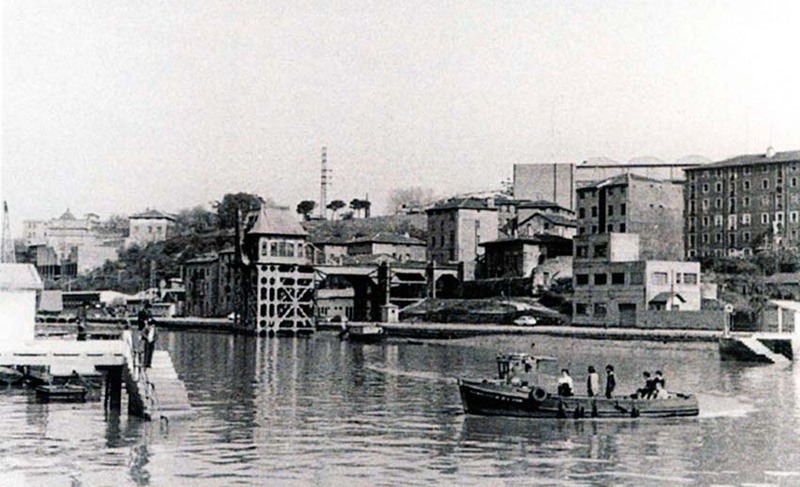 Almost immediately after this we find Molinos Vascos (Spanish). 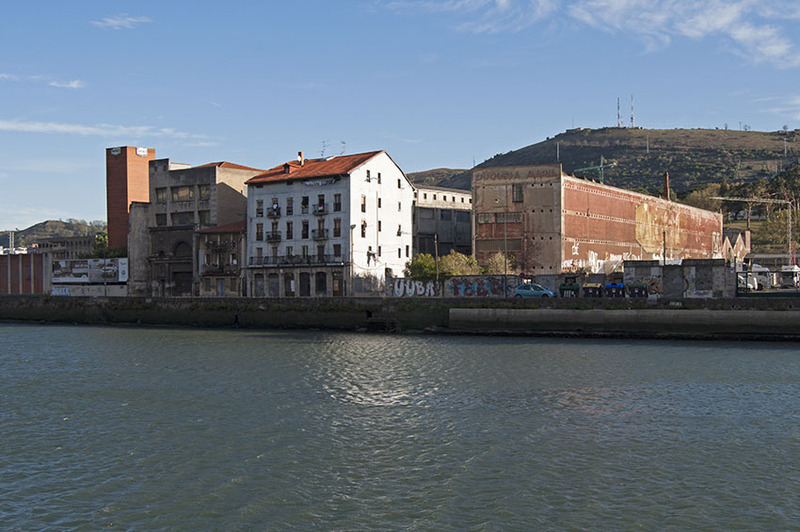 The work of Federico Ugalde in 1924 (15) following the aesthetics of neo-Basque architecture, it was the second building built of concrete in Bilbao after another flour factory: La Ceres (Walk 1). 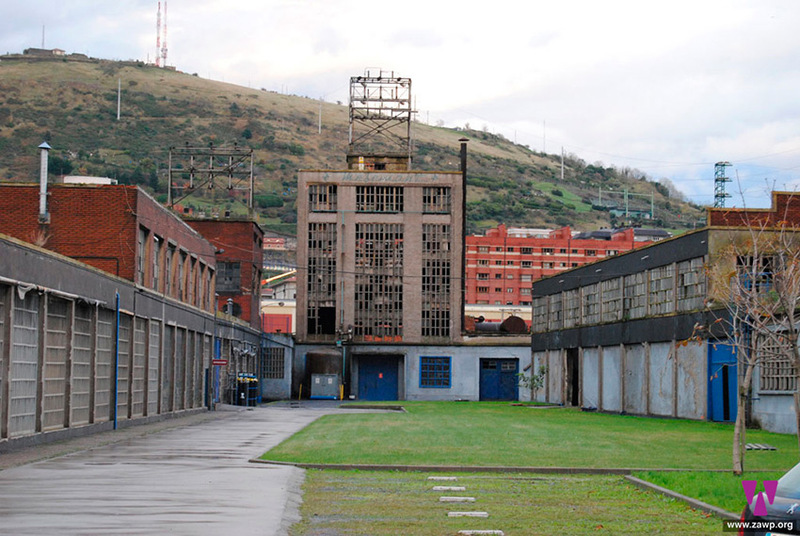 The main building consists of two wings at right angles to each other and occupies about 1,000 m2 of ground, of which 600 is the warehouse and the rest are the silos. 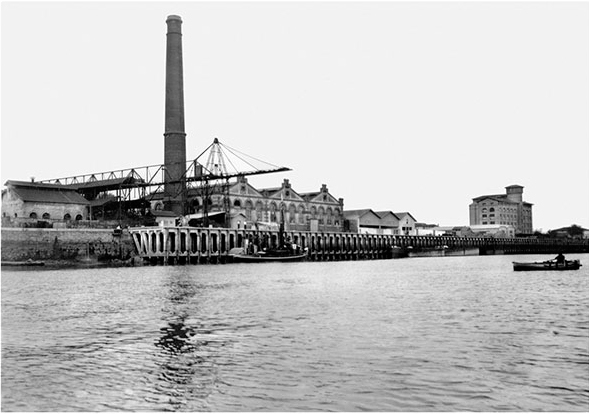 The main facade faces the river and runs parallel to the loading quay and the old railway tracks. 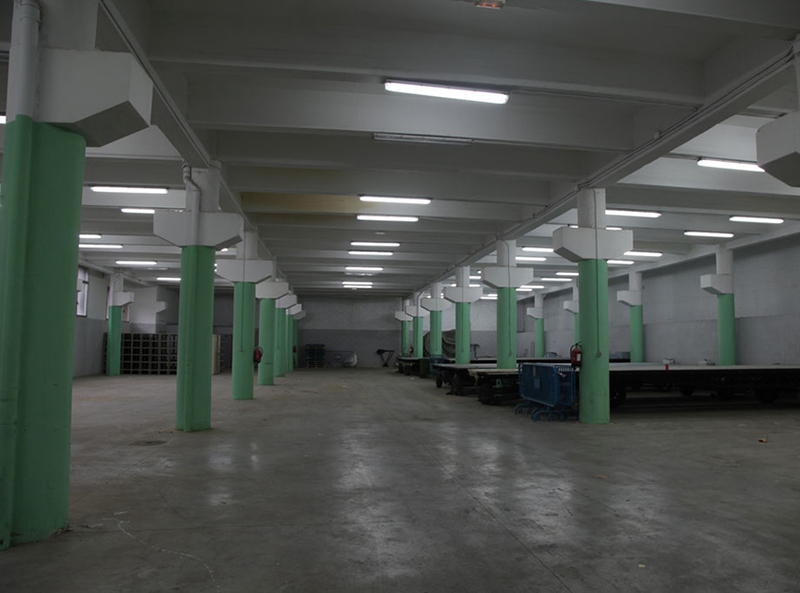 The part used as the warehouse has five floors with large open spaces topped by a roof in the neo-Basque style that makes the building unmistakable. 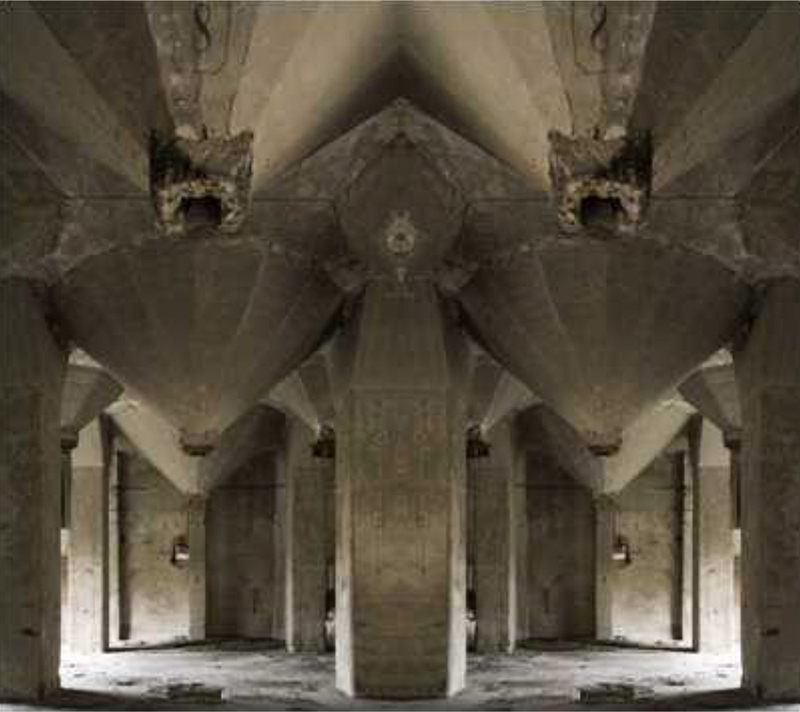 But the most distinctive feature of this construction are the 15 enormous silos measuring 22 metres, each capable of storing up to 75 tons of grain. 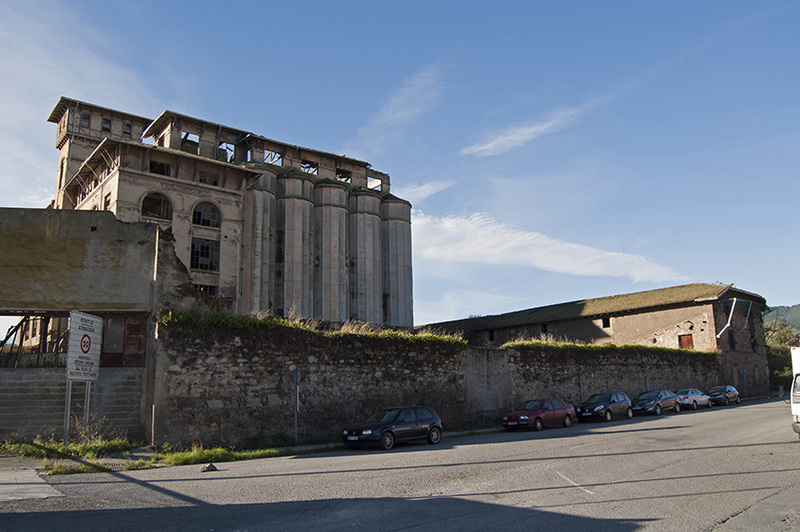 Interestingly, the flour factory was only in operation for 5 years, as it coincided with a time of poor grain harvests and the crash of 1929. 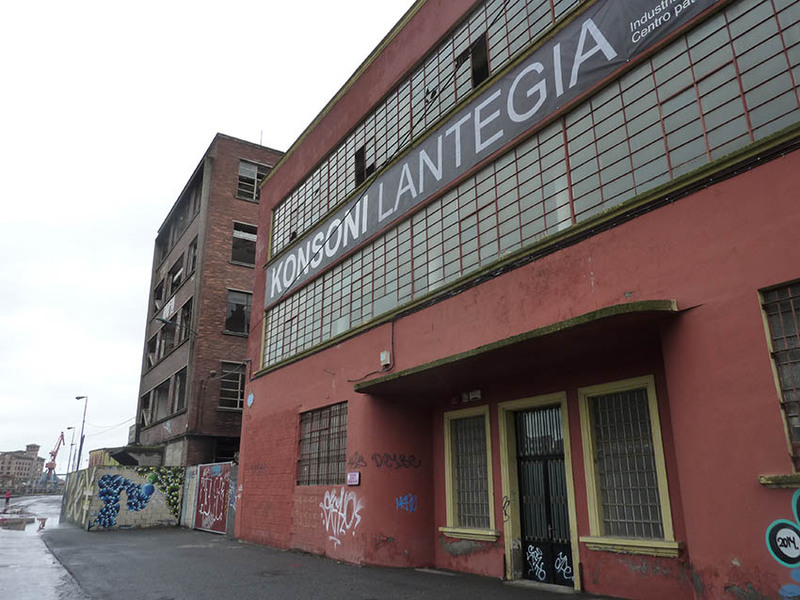 Until its final abandonment as shown in its present form, the building was used as a warehouse. 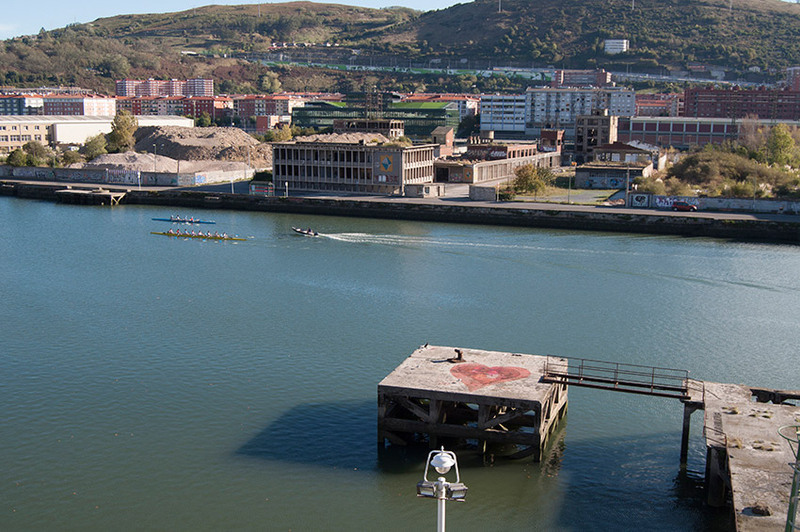 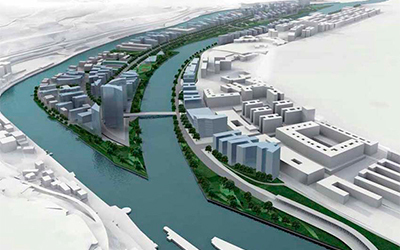 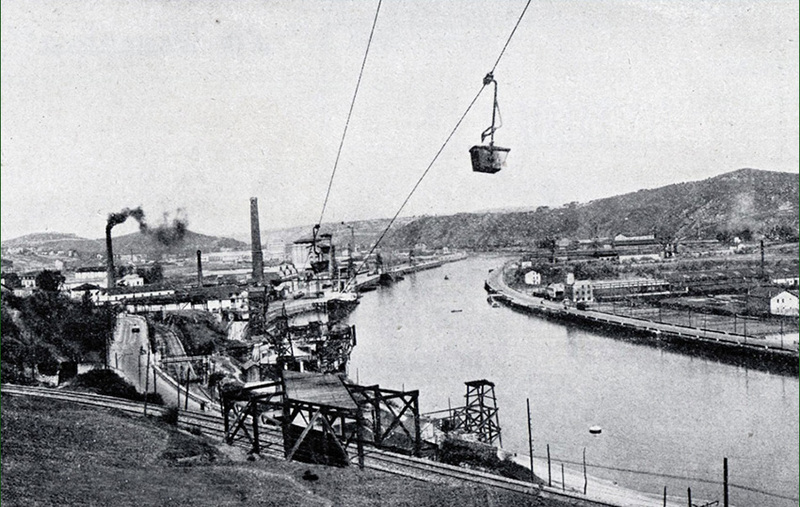 In the construction of the factory, several premises of the former Royal Shipyard of Zorroza were reused. 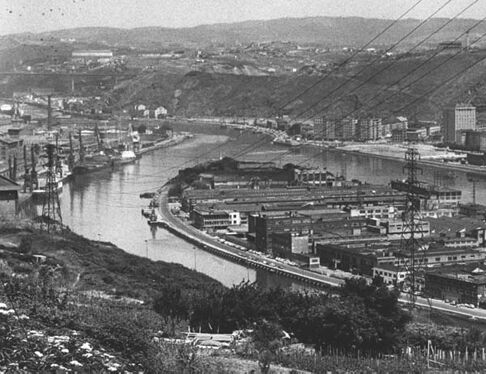 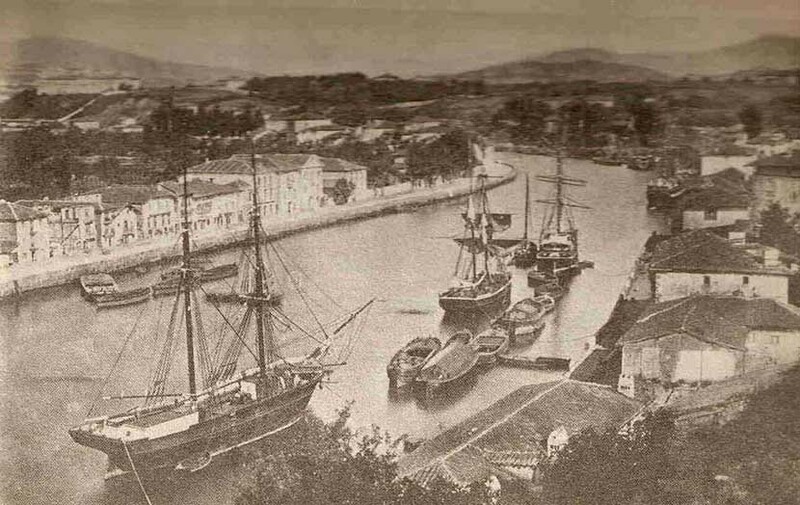 This was one of the largest shipyards on the Cantabrian coast, and it had been in operation since 1615. 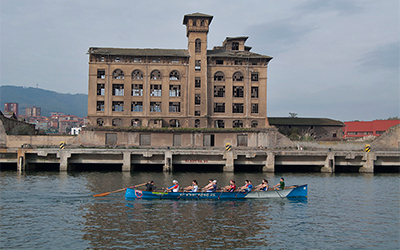 From that early use as a shipbuilding factory, the building called La Cordelería is preserved, a late seventeenth building where the rope for ships’ rigging was made by twisting and spinning hemp. Today you can see the few remains of one of the ends, but the original building was over 400 metres long over 2 floors and was used for spinning and braiding hemp rigging for ships. 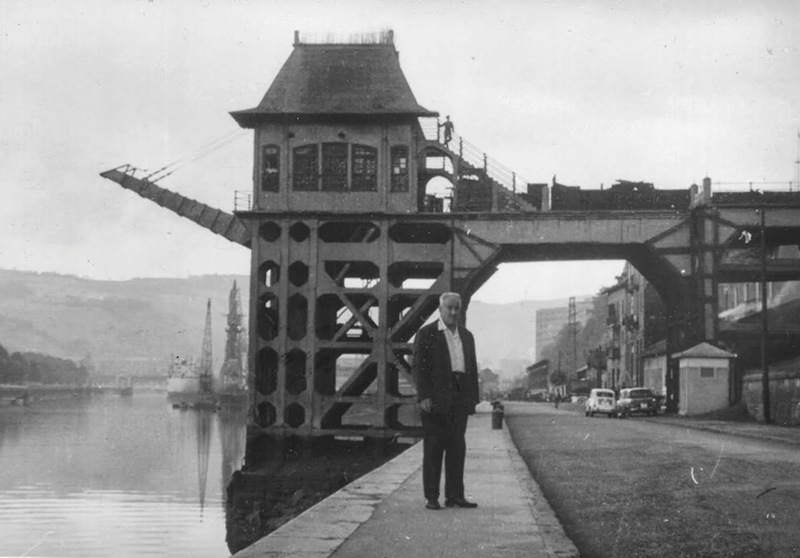 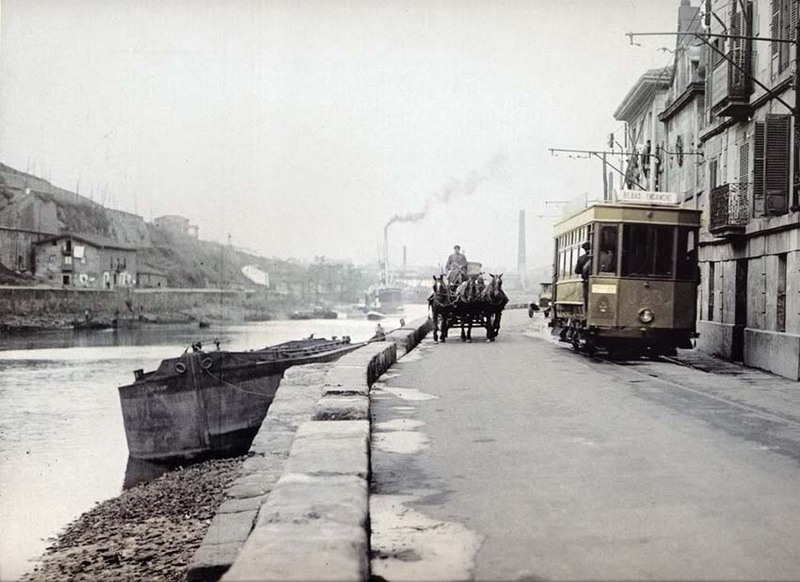 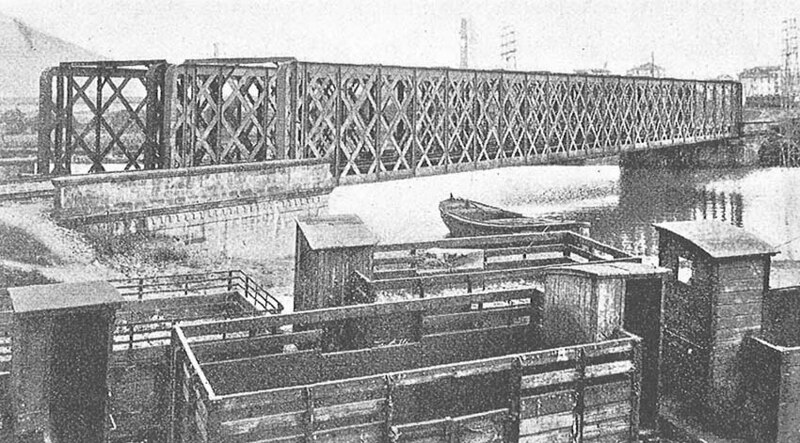 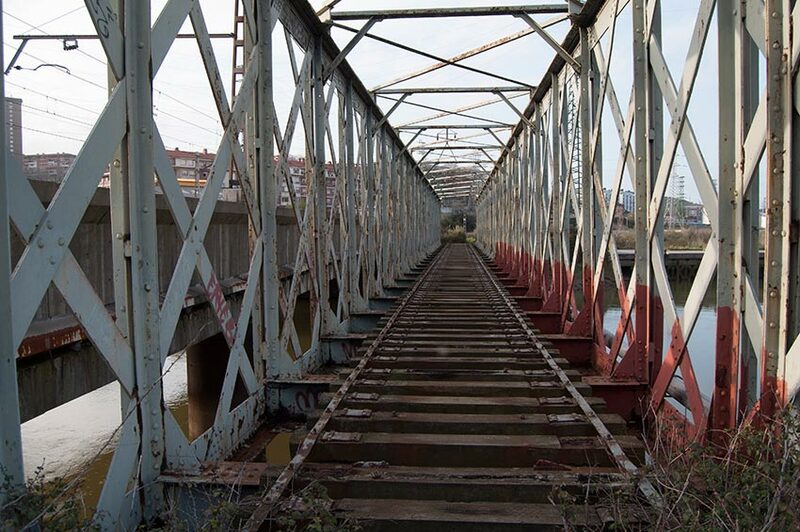 One way to return to Zorroza (to get public transport or walk back to Bilbao) is to do so by going round the installation of the old slaughterhouse to see the metal bridge (Spanish) for the Bilbao-Portugalete railway (16), designed by Pablo Alzola in 1888 (designated as being of Cultural Interest). 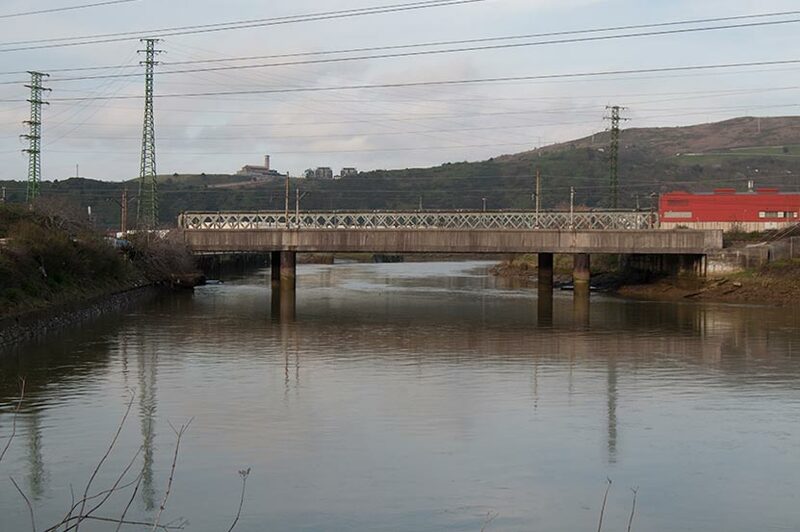 It crosses the Cadagua river with a span of 65 metres without intermediate supports. 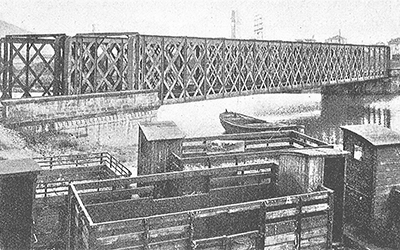 Today, it still has one of the 2 caissons of the original work.